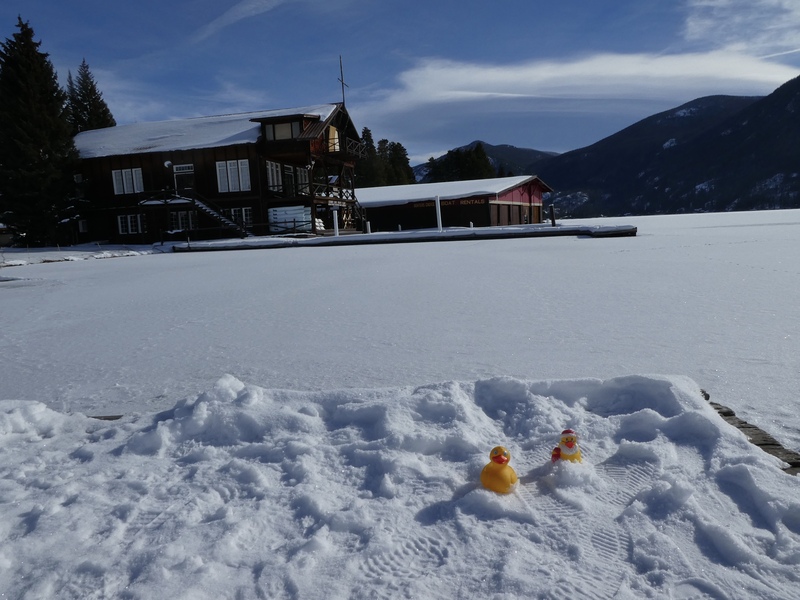 We love visiting Grand Lake, Colorado. 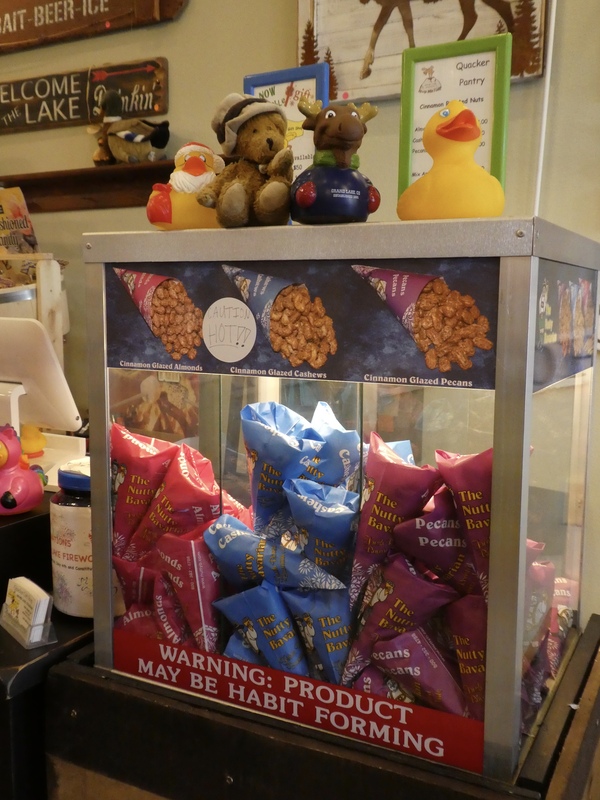 I, Zeb the Duck, and my friend Chanel the Bear, took our moms to Grand Lake. Let’s visit my favorite store, Quackers. 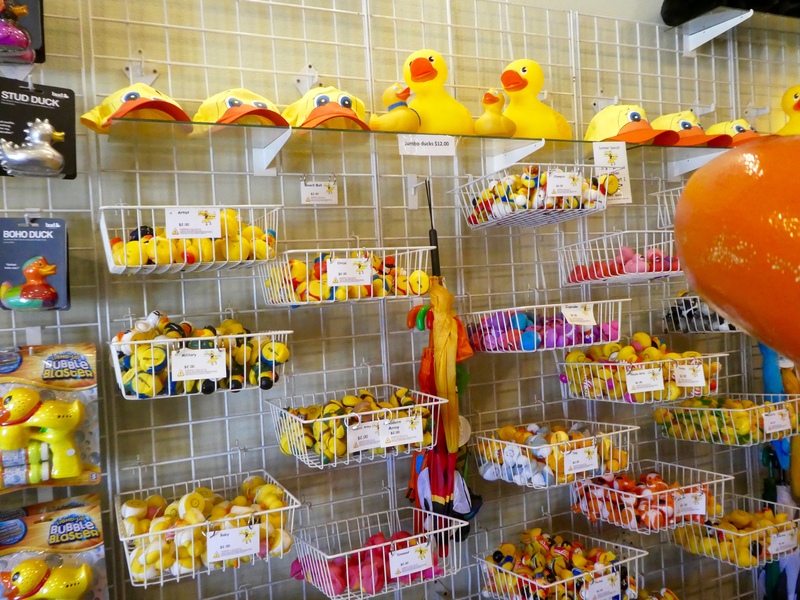 This store in Grand Lake features rubber ducks! 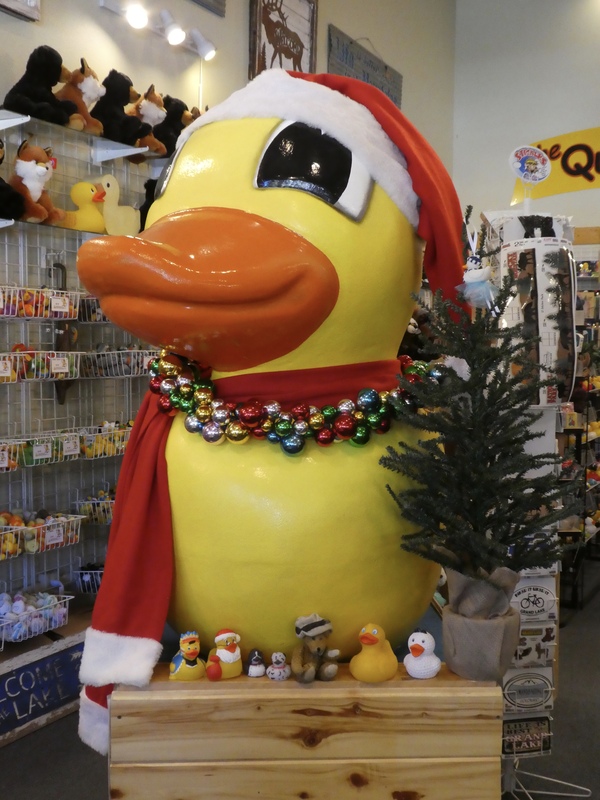 Yes, an entire store dedicated to me and my duck relatives. Meet my largest relative. Chanel and I invited some friends to pose with us. 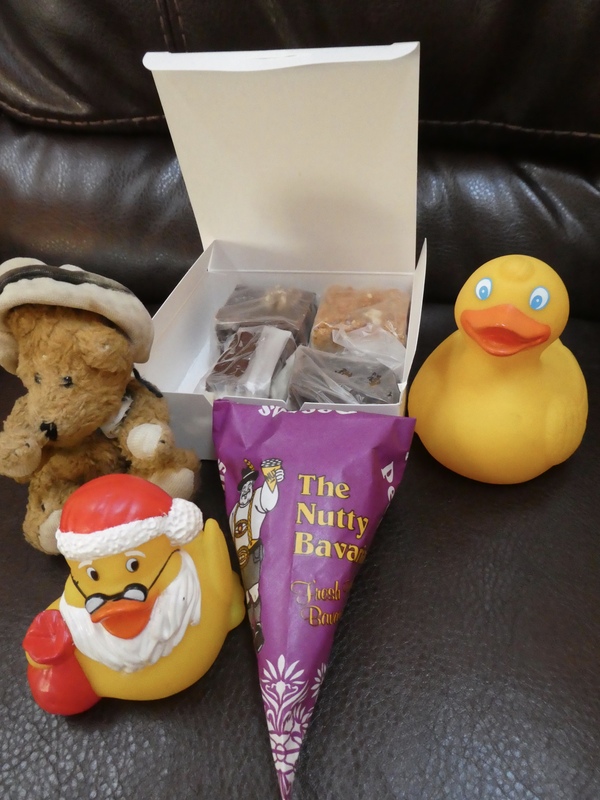 As great as ducks are, we also enjoy the fudge. And there is more. Roasted nuts. Of course some came home with us. 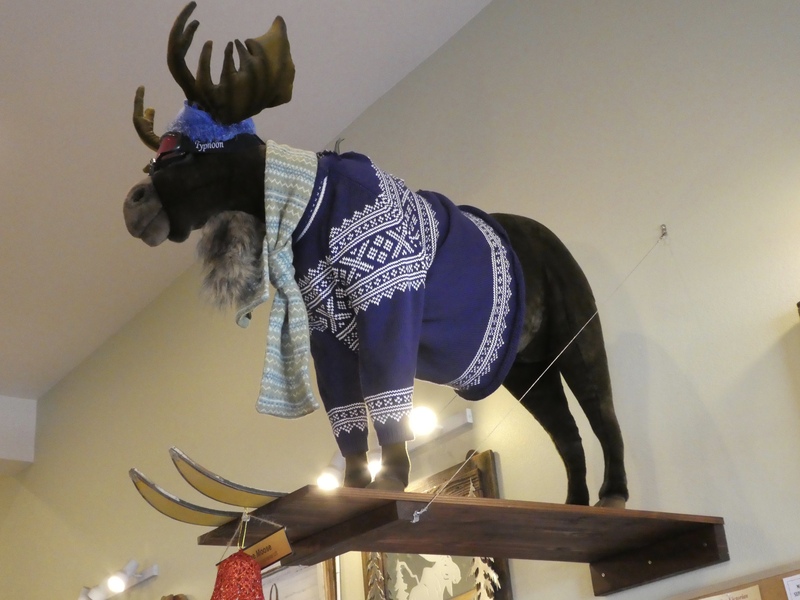 While rubber ducks are the stars of this store, Martin the Moose is pretty great also. Remember we are in the Colorado mountains. Moose do live here. However, Martin is the only moose I ever saw wearing skis. We purchased new family members. And some fudge and roasted nuts. Then headed out for lunch. 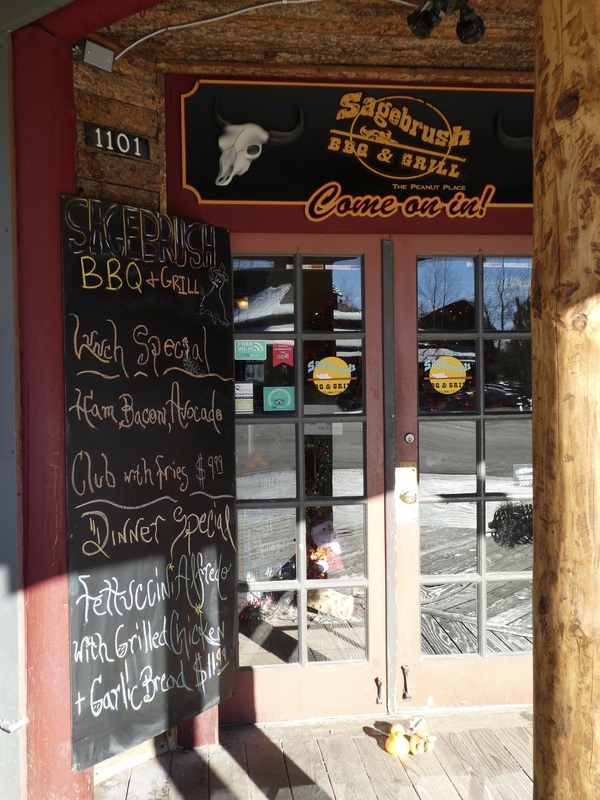 Today our choice is The Sagebrush. Here are some new friends. Aren’t we an attractive bunch of friends? Our table has a complimentary bucket of peanuts. We are to toss the peanut shells on the floor. That is the sign of a fun place to eat. 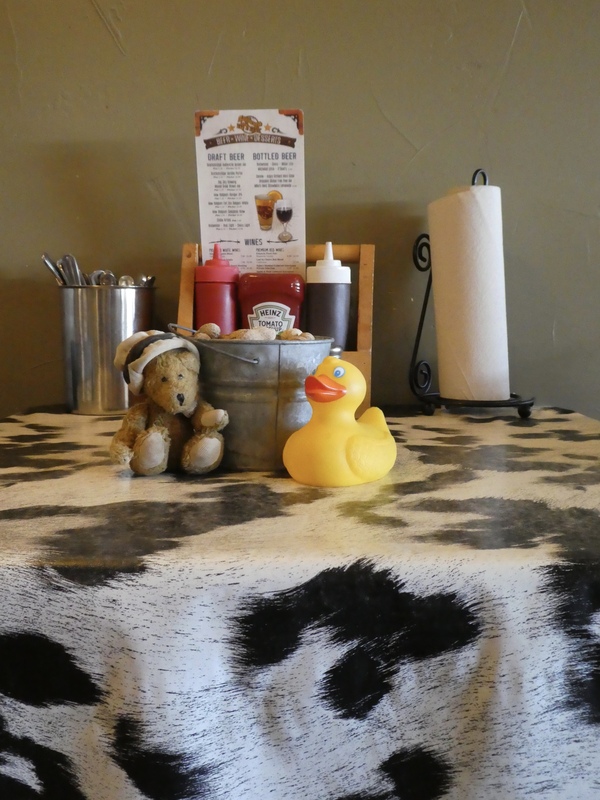 Notice the cow pattern table cover? Our lunch was delicious and the portions were large. A good place to eat when you are in Grand Lake. Now to the adjoining bar. Looks like it is from an old Western movie. 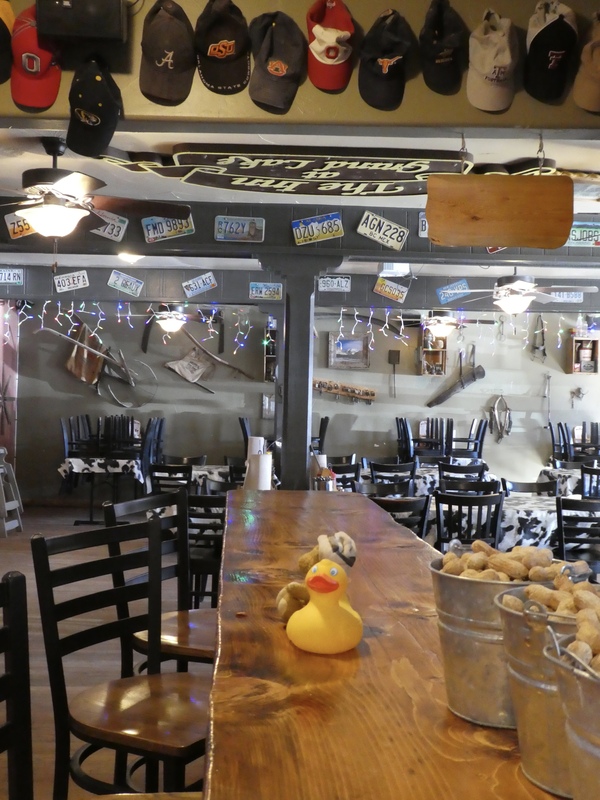 We enjoy the hats and license plates as part of the rustic decor. 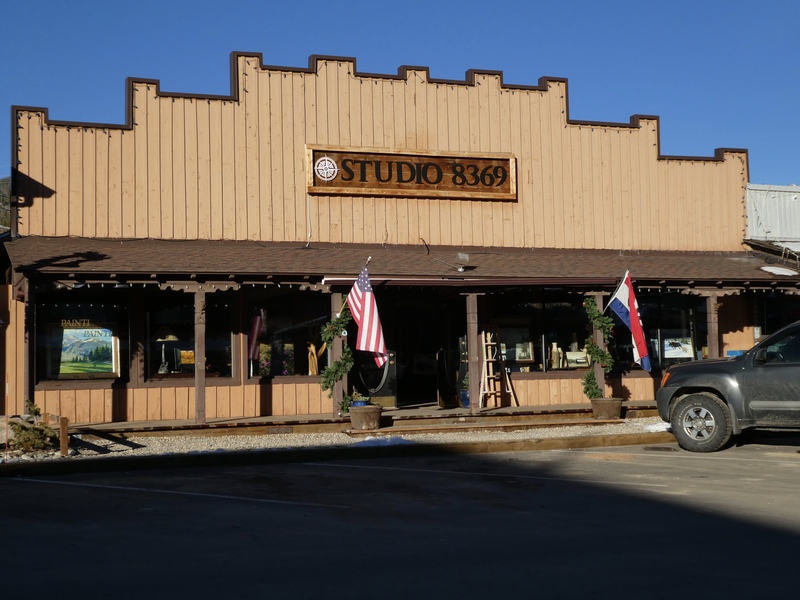 Our next stop is Studio 8369, an art studio in town. 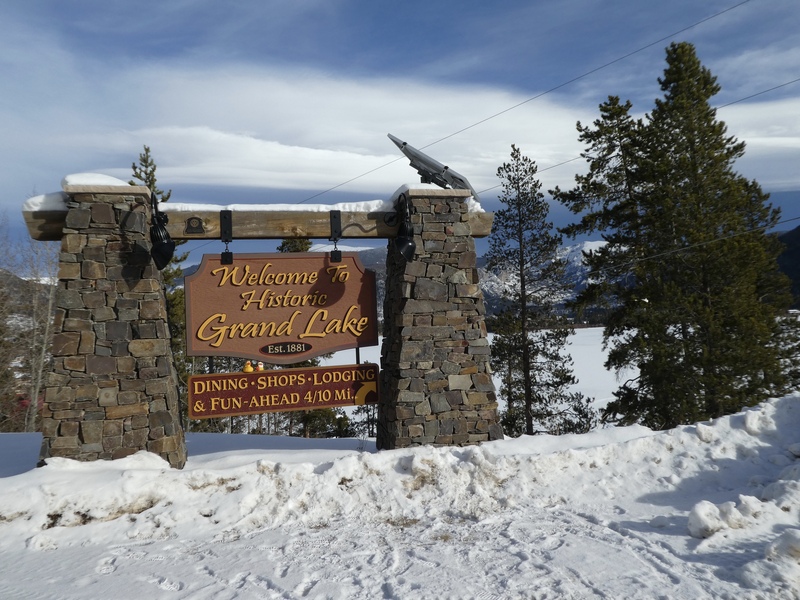 The 8369 refers to the elevation of the town of Grand Lake. That is about 2550 meters above sea level. The Rocky Mountains in Colorado are rather high. Inside Studio 8369 we admire the Gourd Art. This is by Ivy Howard of Grand Lake, Colorado. 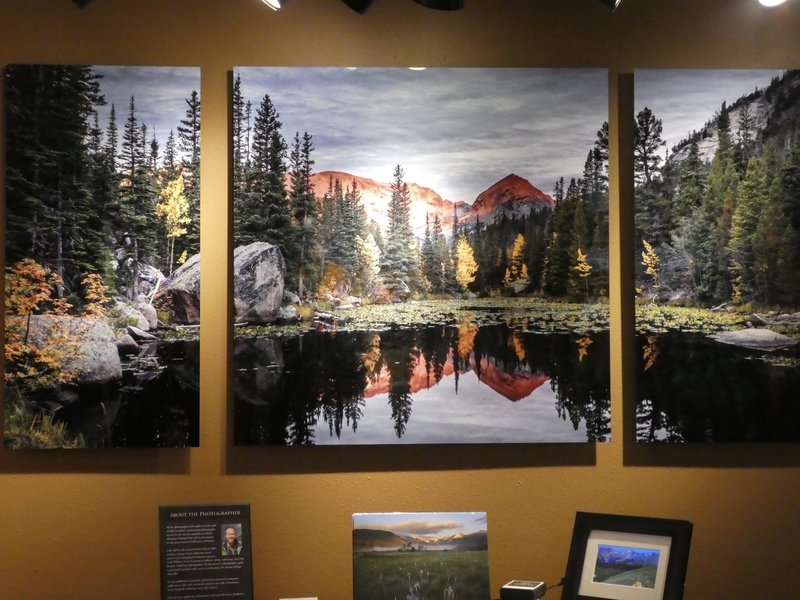 Surrounded by the Rocky Mountains, Studio 8369 has some beautiful photography. You would love this place. A couple weeks later mom and I returned to Grand Lake. This time there was more snow. 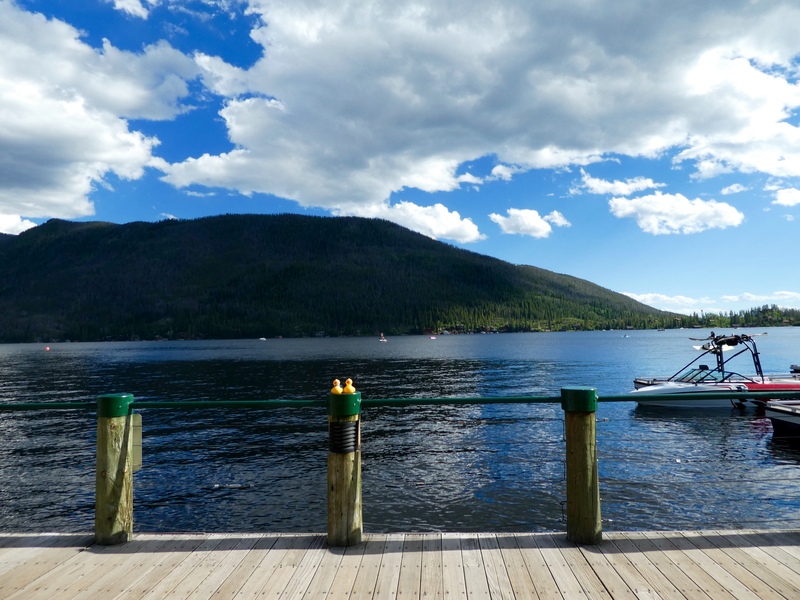 A few miles from Grand Lake is Lake Granby. We loved the partially frozen lake and the low clouds. Driving through town, past Quackers, we went to Grand Lake. Grand Lake is the largest and deepest natural lake in Colorado. 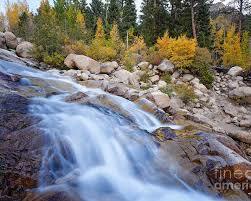 It is also part of the headwaters for the mighty Colorado River. Remember the Colorado River heads southwest and continues to carve the Grand Canyon. 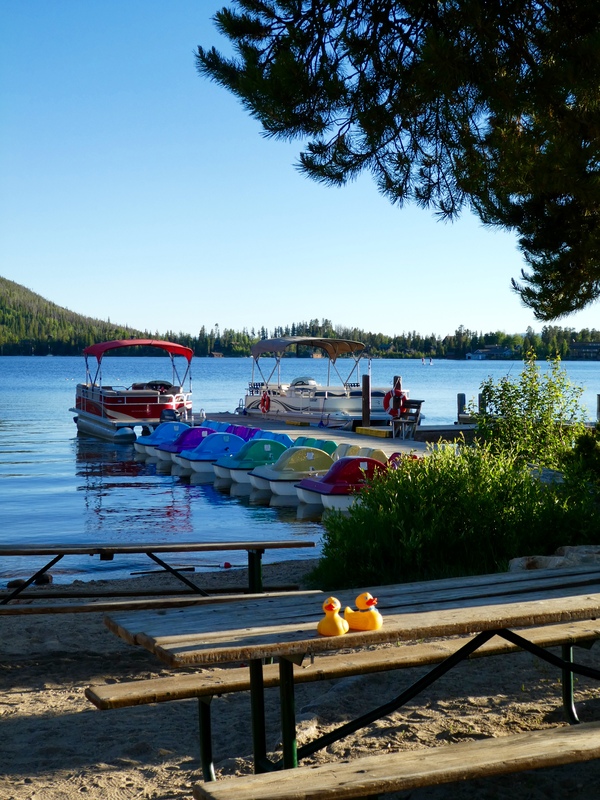 In the summer tourists can rent boats to explore and enjoy the lake. Now snowy and frozen, we enjoy a winter landscape. 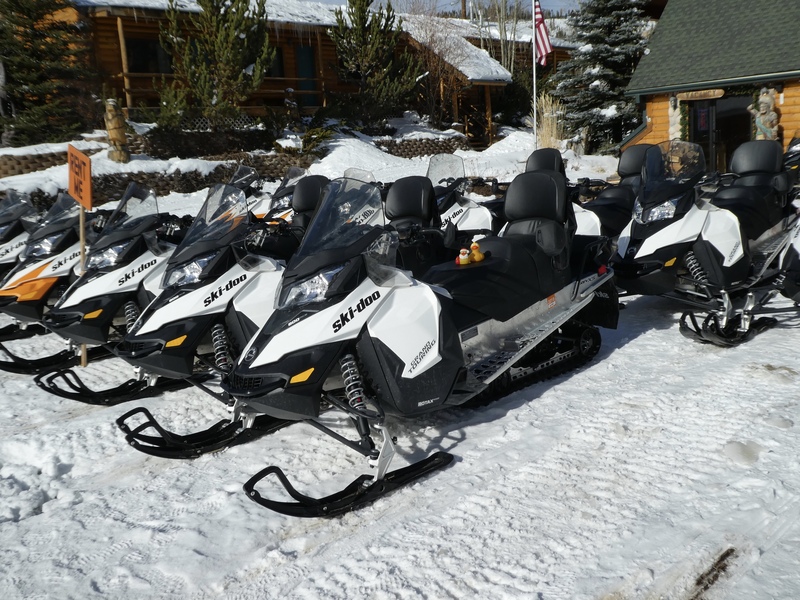 Back into town, near Quackers, we spotted these snowmobiles, or snow machines. Mom said we were not renting them today, but we had to try them for size. These are big. The employees at Spirit Lake Lodge rent these machines. 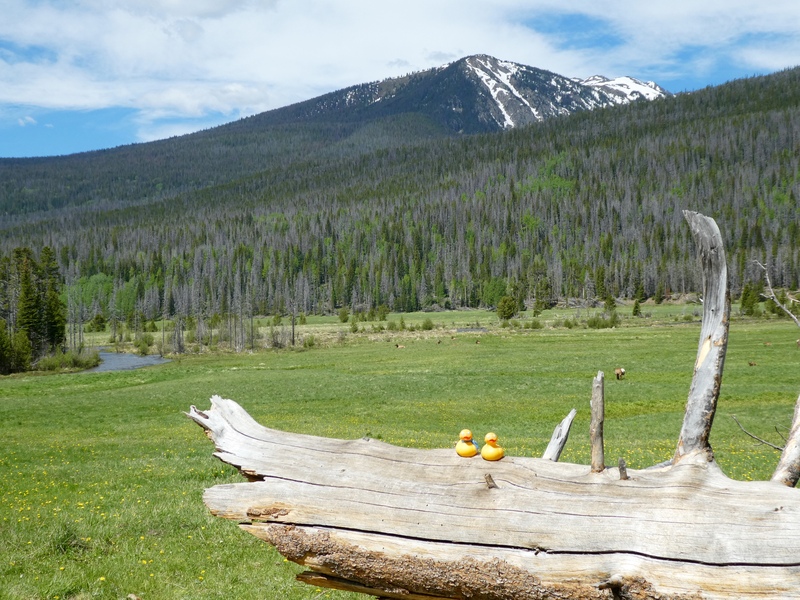 They were very nice to us, the Colorado Traveling Ducks. A drive into Rocky Mountain National Park was next. Grand Lake is at the western entrance to Rocky Mountain National Park. The road had been cleared. 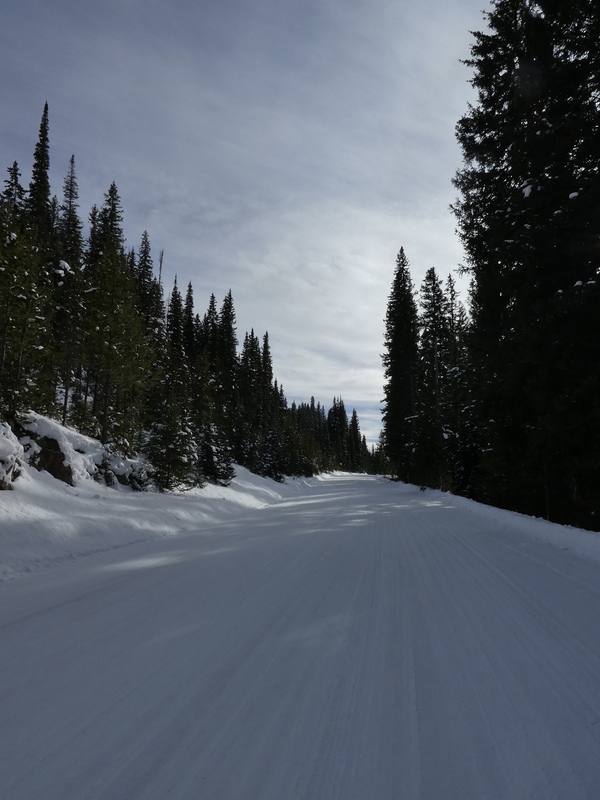 Isn’t this a beautiful winter drive? However the road is only cleared for part of the park. This road ascends to over 12,000 feet (3657 m) and is closed during the snowy winter months. We did enjoy many beautiful winter scenes. As you know, we love our mountains. Both in the summer and in the winter. We hope you explore a little and enjoy our mountains during the winter, or explore your part of the world and enjoy all the seasons. It is a new year, so enjoy and discover new things and places. And tell us about your adventures. 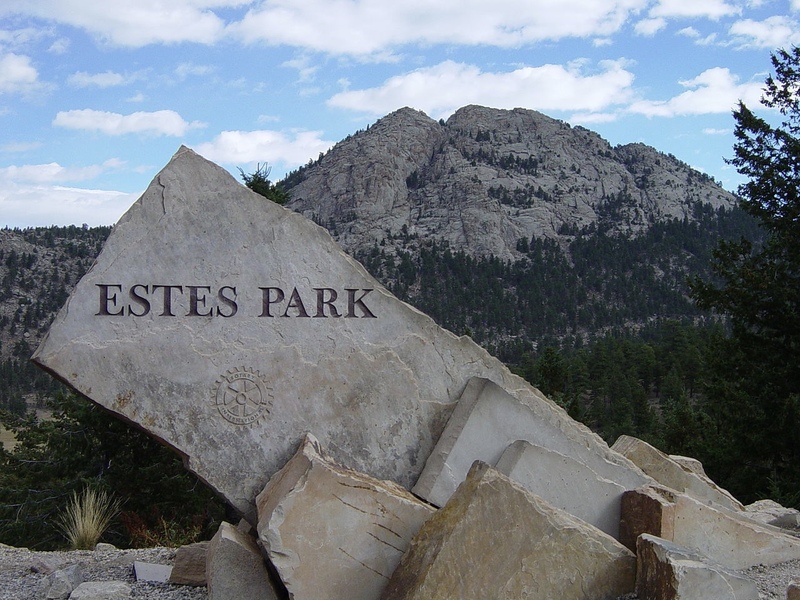 A gateway city to Rocky Mountain National Park, we love the resort town of Estes Park. It was overcast with car headlights on the rock. We liked the shadows on the stone. Fall River flows from Rocky Mountain National Park into Estes Park. 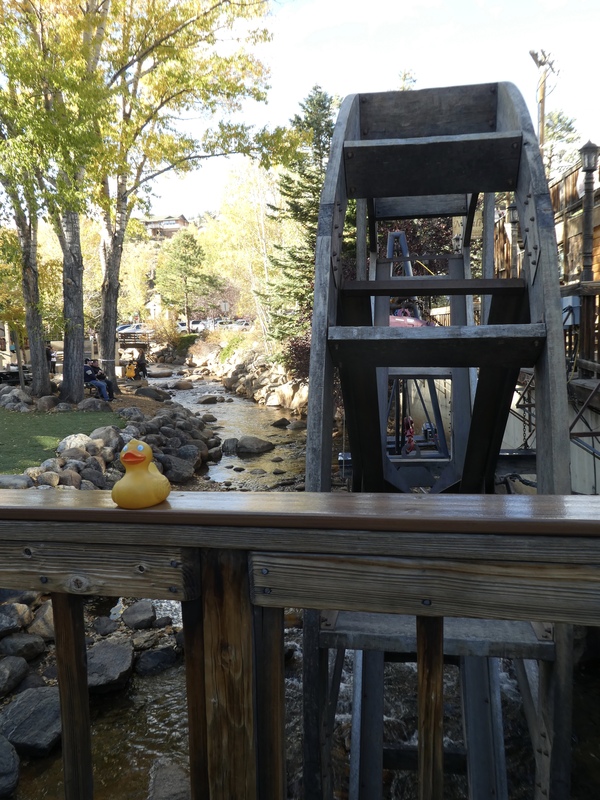 We love the water wheel in the river by this small park. 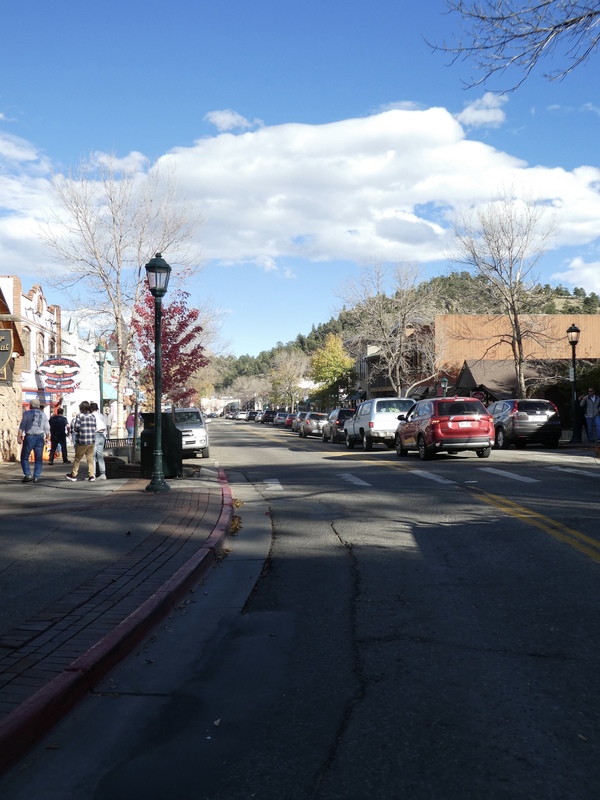 Elkhorn Avenue is the main street in Estes Park. We usually walk from one end to the other, stopping in various shops and often a restaurant. One of our standard stops is The Taffy Shop. 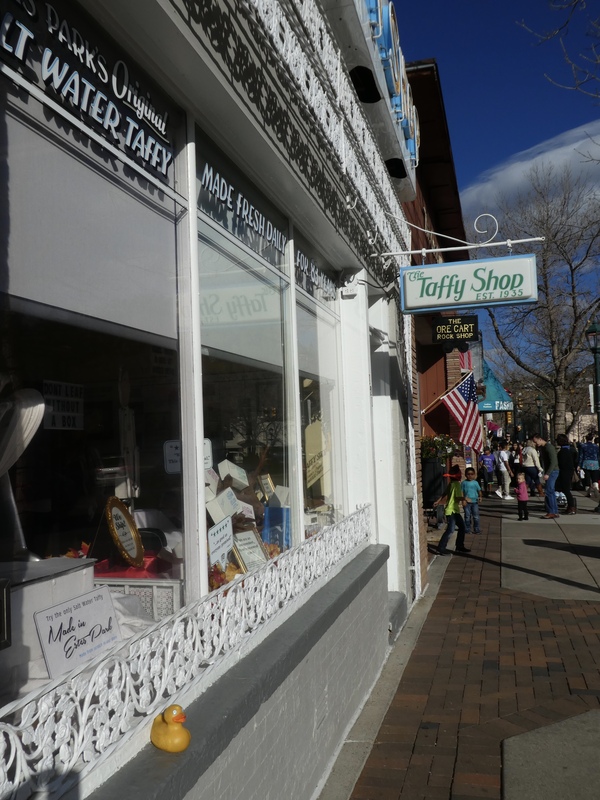 There are several taffy shops, but we have been coming to this one since mom moved to Colorado in 1975. The taffy is made right here and it is delicious. Try the Texas Pecan. 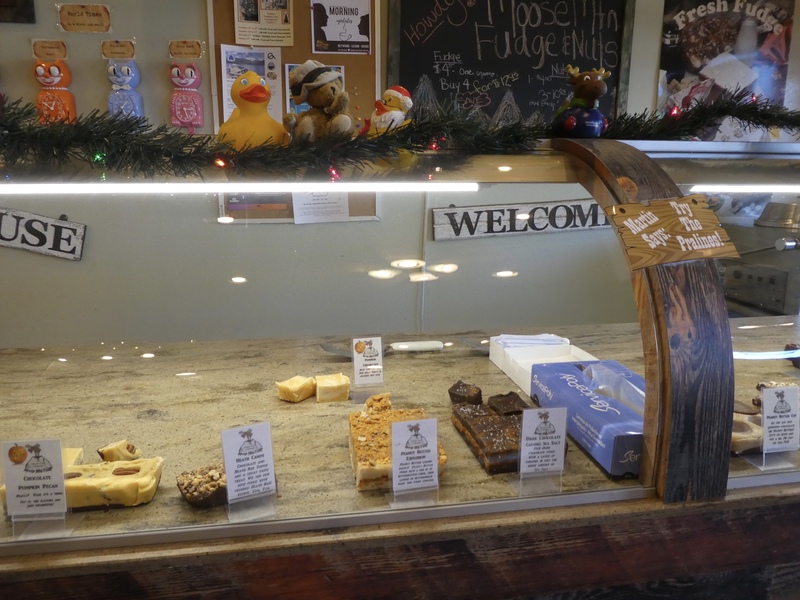 Another regular stop is Laura’s Fudge Shop. 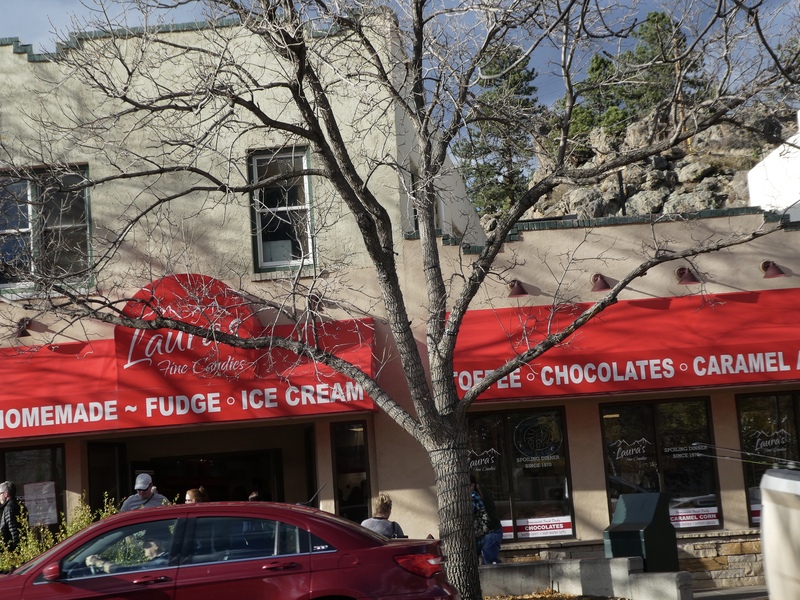 A few years ago, Laura’s expanded but the shop is always crowded with locals and tourists. That really says the fudge and more is excellent. We enjoy Turtle Fudge and Chocolate Peanut Butter Fudge. And the toffee, and the caramel apples. Yum! We did our shopping, crossed the road, followed the river and got in our car. This is fall, the rut, or mating season of the elk. 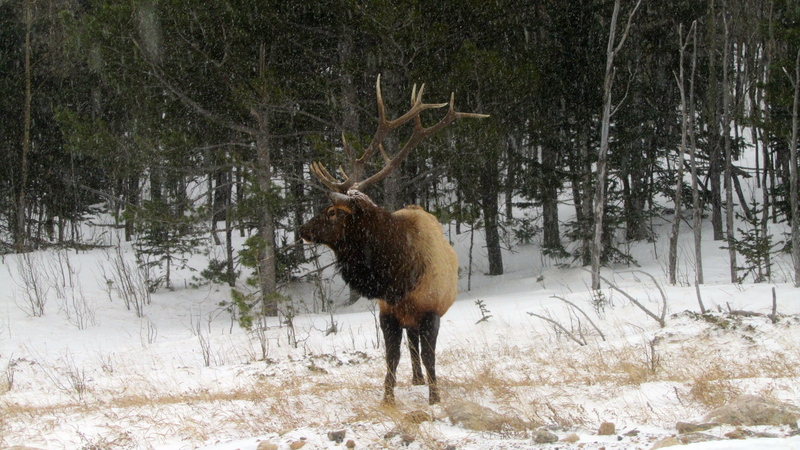 This time of year, we hear the male, or bull elk, calling his mates, sounding like a bugle. The female may answer with a rather shrill squeal. 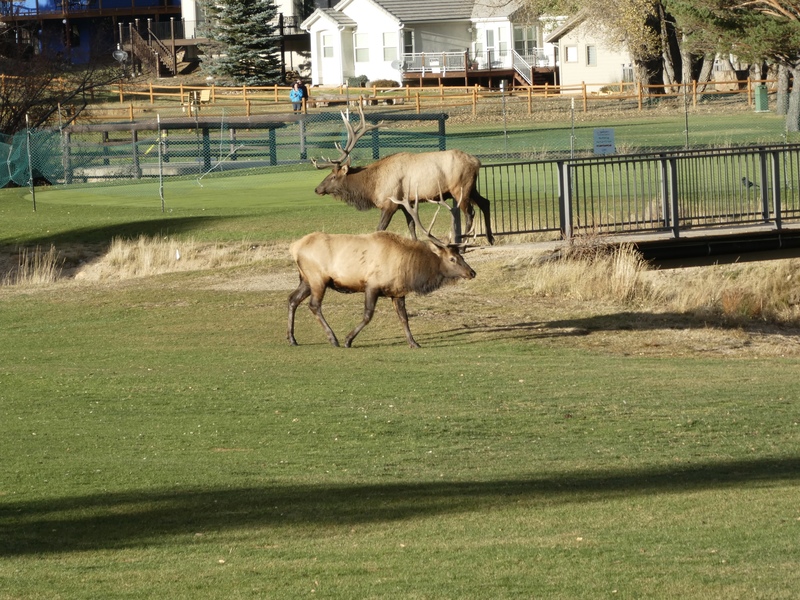 The elk often leave Rocky Mountain National Park and wander in and around Estes Park. 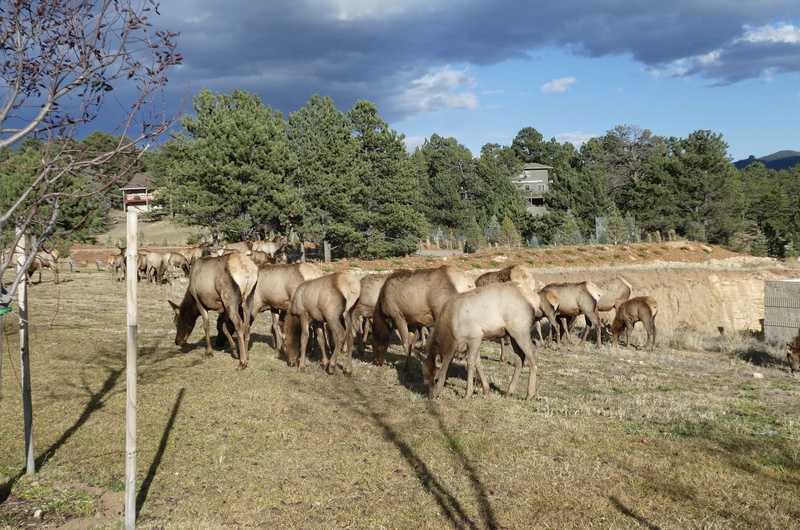 This herd is behind the Aspire Residences, part of the Stanley Hotel. 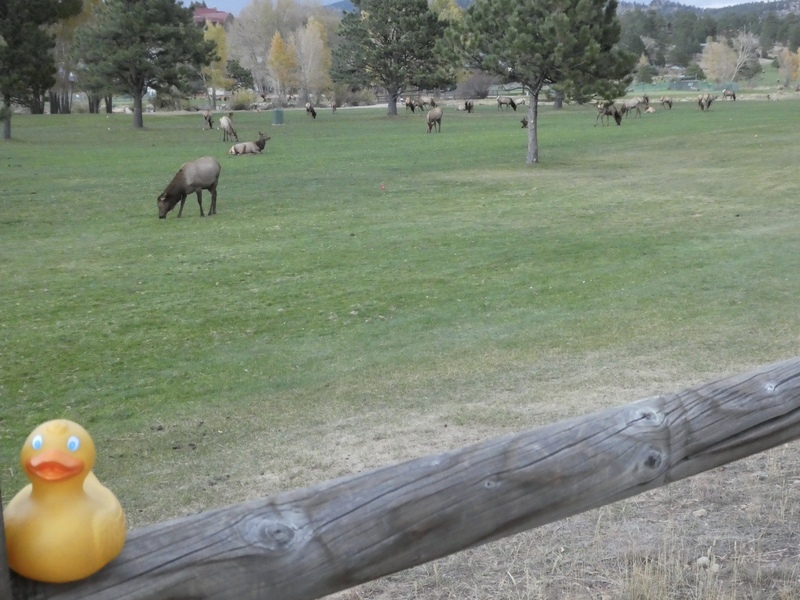 There were several humans sitting on balconies enjoying the elk herd. As you can tell, the herd is gradually moving to another area. But some are not in a hurry. This young elk is hungry and trying to nurse, but mom doesn’t stand still very long. They have moved, crossed a major street, and are now in the golf course. The lone male watches the females. He tries to keep them together. This bull does a lot of running, or sprinting, to keep the girls where he wants them. Oh, a second herd is arriving. They will join the first herd on the golf course. How will this end? 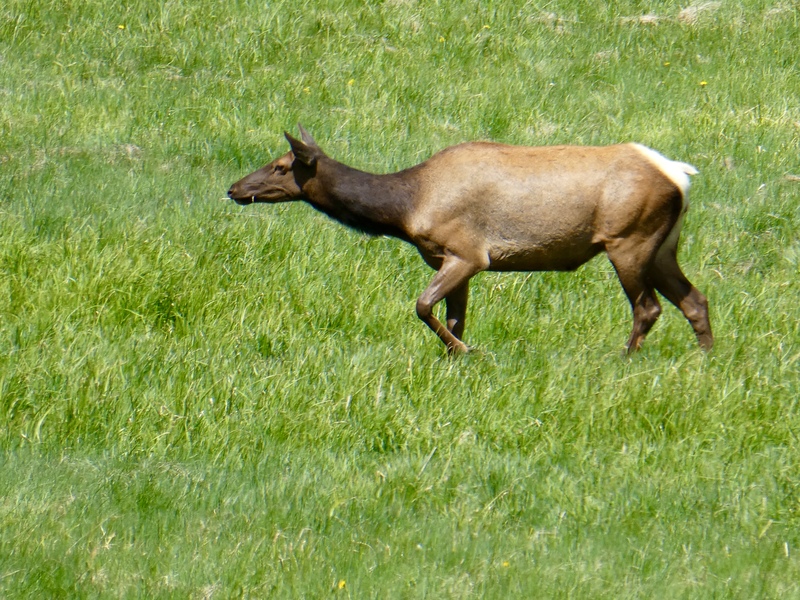 The two bull elk, one from each herd, pass each other, without incident. 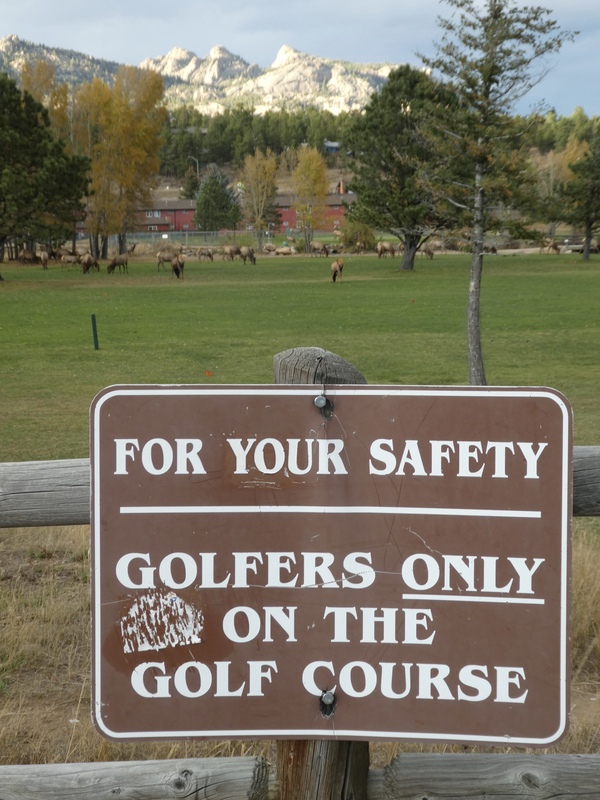 But, we don’t think the elk can read. Only golfers on the golf course. Well, is it tee time ladies? The elk and humans mingle well. 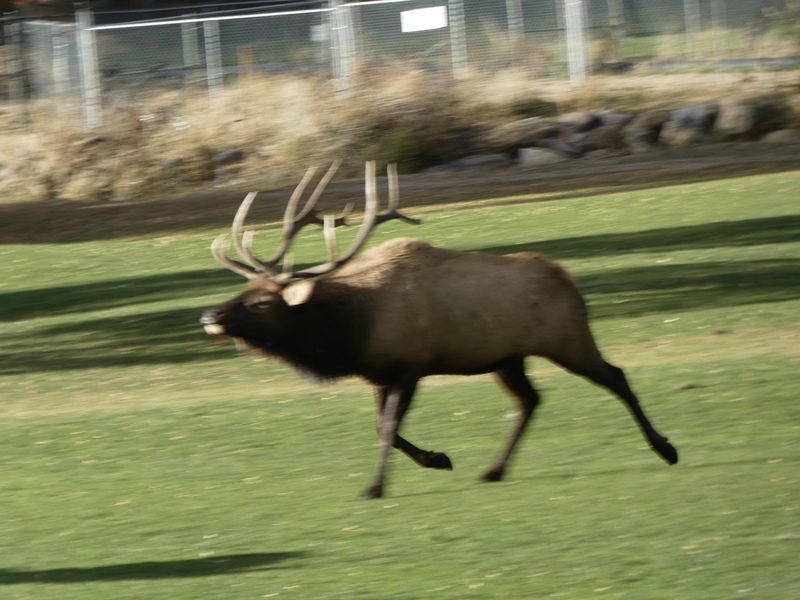 If the elk want to move, the humans scatter to allow the elk freedom to go wherever they wish. 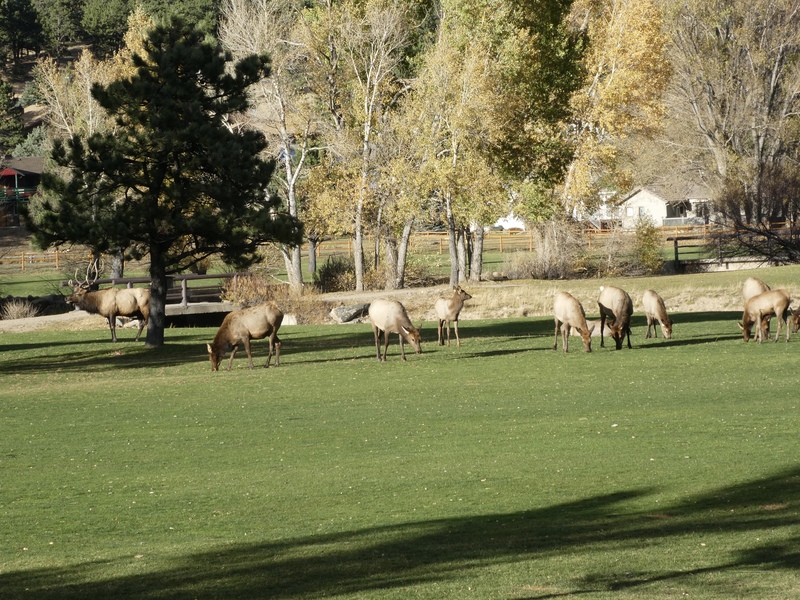 Further along, a herd is around Lake Estes. 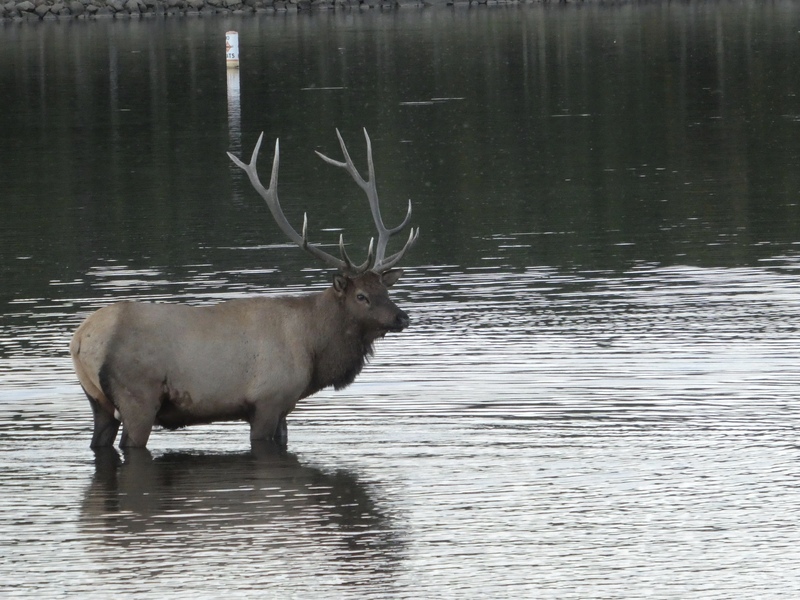 This bull is cooling off and probably drinking in Lake Estes. The sun has set. 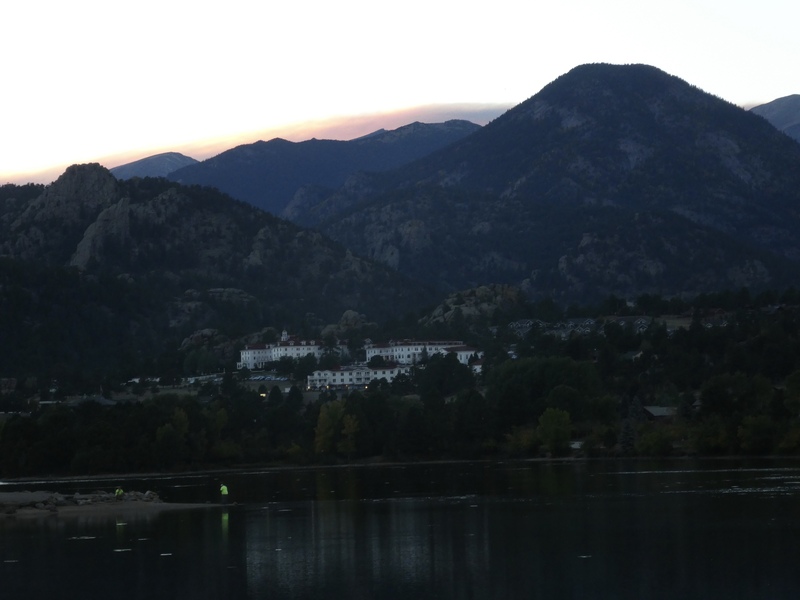 The Stanley Hotel is illuminated by the glow of the setting sun behind the Rocky Mountains. A beautiful end to a beautiful day. 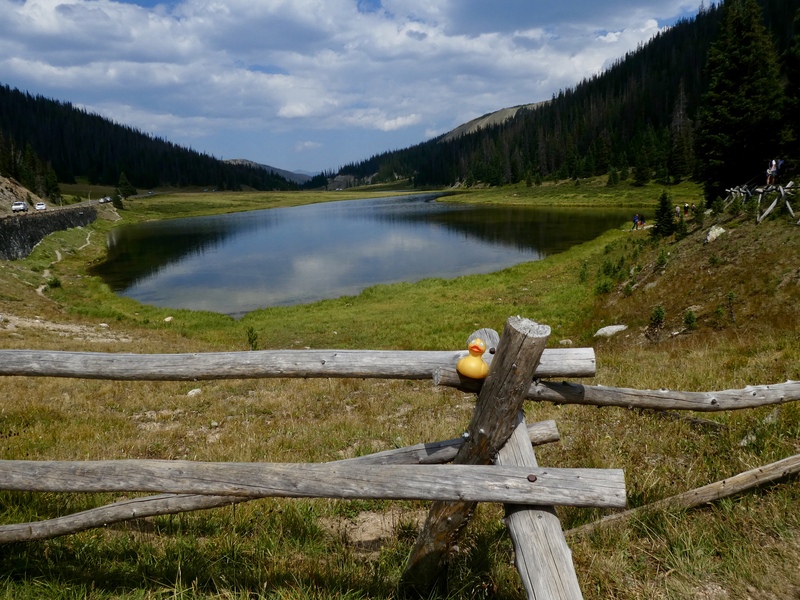 A favorite summer drive for us includes visiting Winter Park, a stop at Grand Lake where we enter Rocky Mountain National Park. 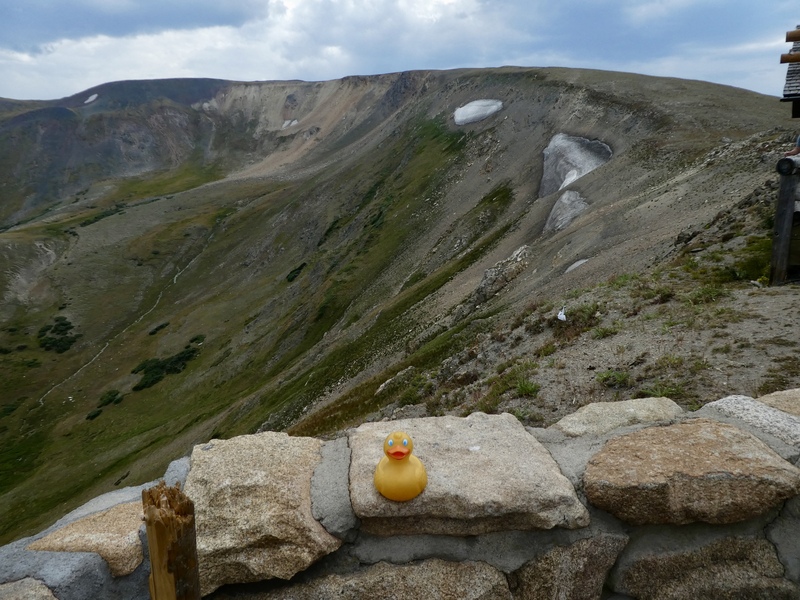 We drive over Trail Ridge Road, the highest continuous paved highway in North America. Exiting the national park at Estes Park we stay there for a little shopping and then return home. It is a full day, but a wonderful day. That is the plan for today. First stop is Winter Park, Colorado. This is a mountain resort, skiing in the winter and many opportunities in the summer. 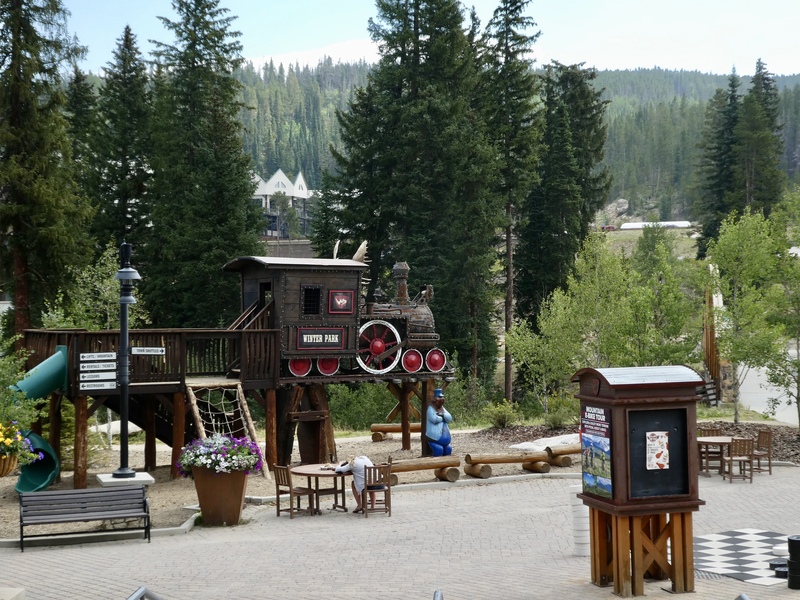 In the winter there is a ski train from Denver to Winter Park. In the summer we love the Alpine Slide. It is hard for mom to get photos of this, but here you can see the half pipe track we use. Also there is a rider on a sled at the end of the ride. 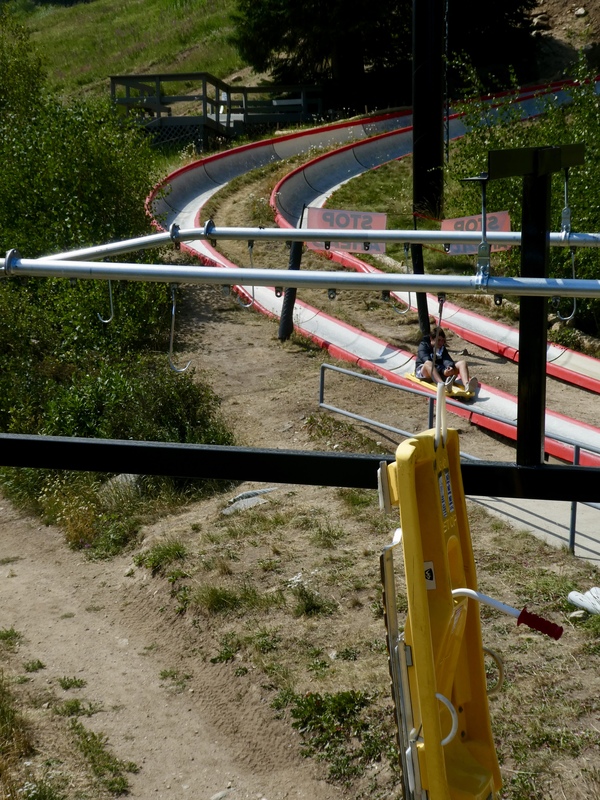 When we finish, we take our sled and hang it on the line so it can be taken back to the top of the ride. We ride the ski chair lift to the top of the mountain, get off, walk a little way to get a sled, put our sled on the half pipe run, sit on sled, check our brakes and ride to the bottom of the mountain. It is really fun! 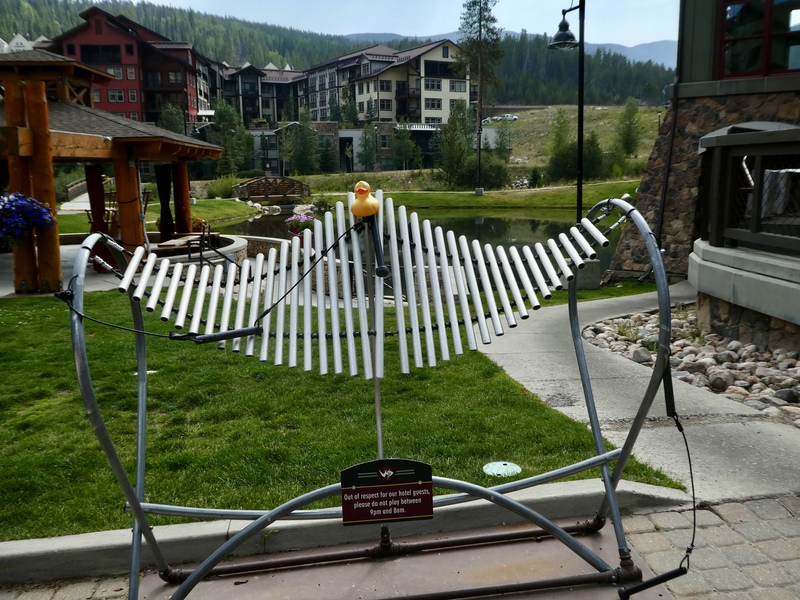 We can make music here at Winter Park Village. In the winter humans ice skate on the lake behind us. Back in the car, we drive to Grand Lake, Colorado. Grand Lake is the name of the town, but there is a lake, named Grand Lake here. Hardy souls swim here, but we don’t want to swim in a cold mountain lake. But these boats on Grand Lake are really fun. Now let’s enter Rocky Mountain National Park. This is one of four national parks in Colorado, and probably our favorite. 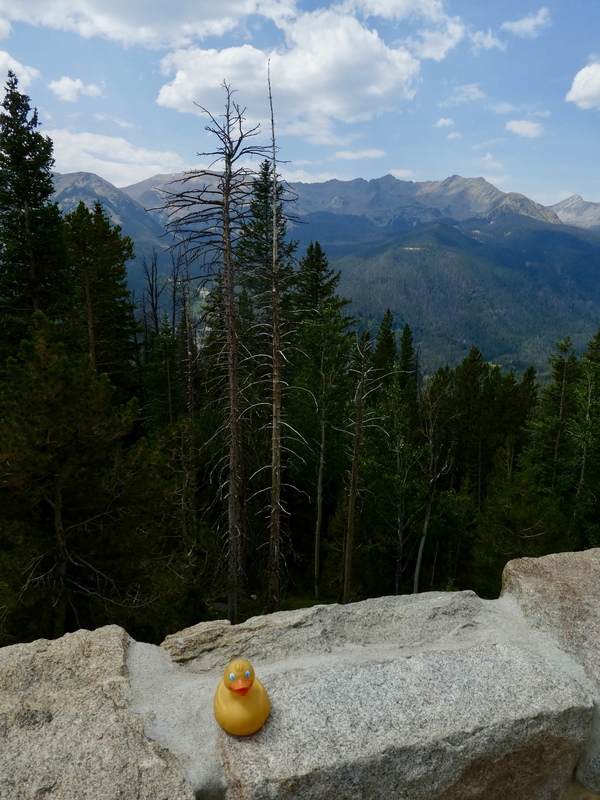 Here I, Zeb the Duck, am admiring the beautiful mountain scenery. You may notice dead trees behind me. The Pine Bark Beetle is killing many of our lodge pole pines. This beetle epidemic is in Canada, the United States and into Mexico, killing trees in the forests. This beetle epidemic has occurred several times in the past 500 years, but it is so sad to see so many dead trees. I just love lakes. This alpine lake is so beautiful and so serene. 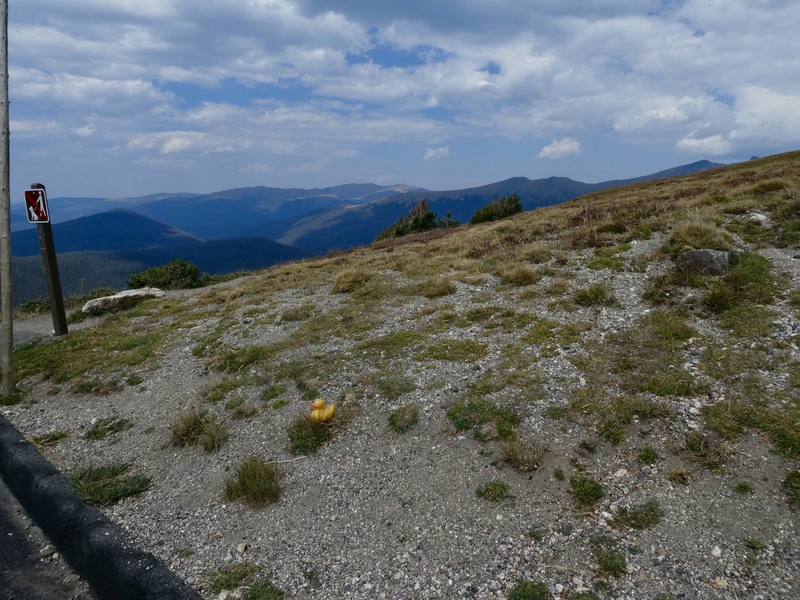 Driving further up the mountain on Trail Ridge Road, we are now above timberline. 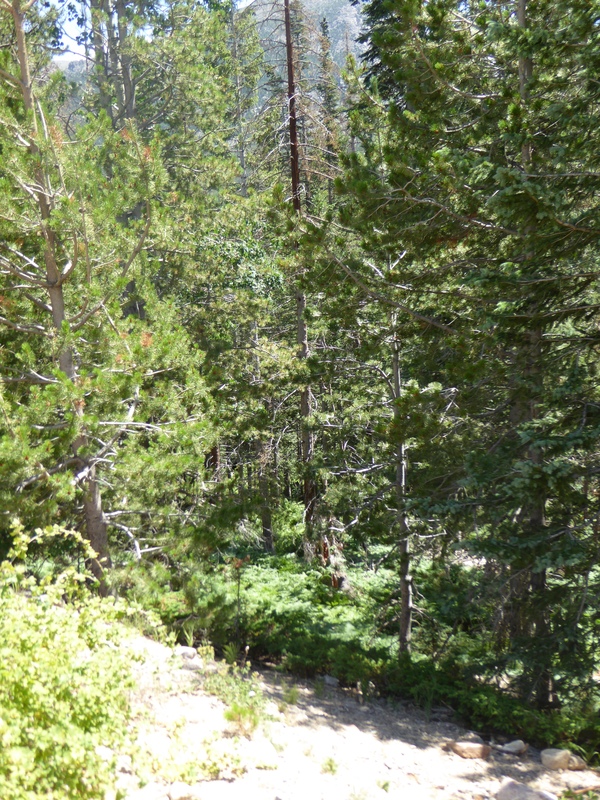 The growing conditions at this altitude and temperatures are too severe for trees to grow. You can see a lake and snow below us. We were there in August, so this snow is from last winter. Remember, the higher you go, the colder it gets, so snow in some areas doesn’t always melt during the summer. 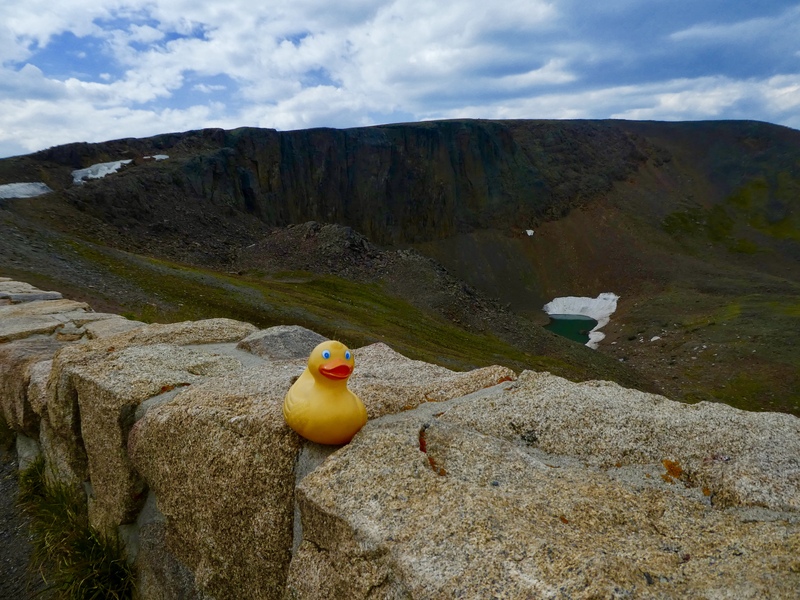 On Trail Ridge Road we have experienced incredible mountain scenery. We climbed through alpine conditions. Visited above timberline. Stopped near Visitor’s Center. Passed through Arctic tundra. 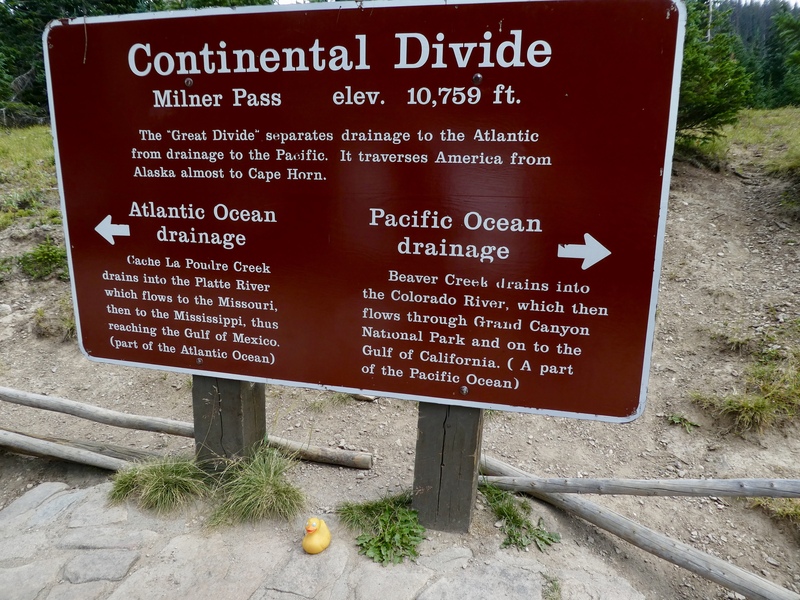 We crossed the Continental Divide. Viewed landscaped shaped by volcanic activity. 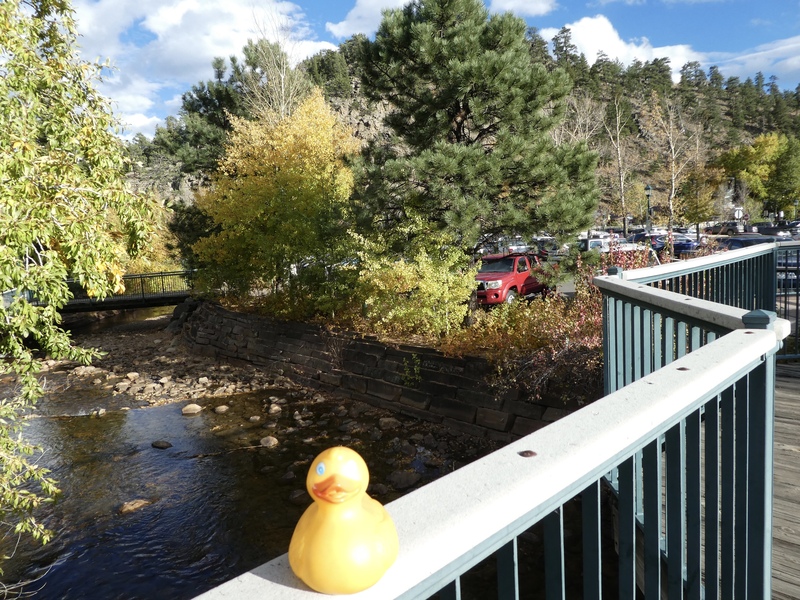 And descended into the resort town of Estes Park. We could spend days or more exploring this park and take thousands of stunning photos, but not today. We enter Estes Park. We walk through town and of course mom always stops at Laura’s Fudge Shop and at the Taffy Shop. At one of town, we watch the river and listen to the soothing sounds of water tumbling over the rocks. Scenic river through Estes Park, Colorado. This is a free photo from the internet. We love this town and we love this drive. When you visit Colorado, we encourage you to drive over Trail Ridge Road. Did we mention that we love our home state of Colorado. Well, we do. We even have a special gift shop here. Grand Lake, Colorado is a lake and a town, located at the western entrance of Rocky Mountain National Park. Let’s visit a little of the park. 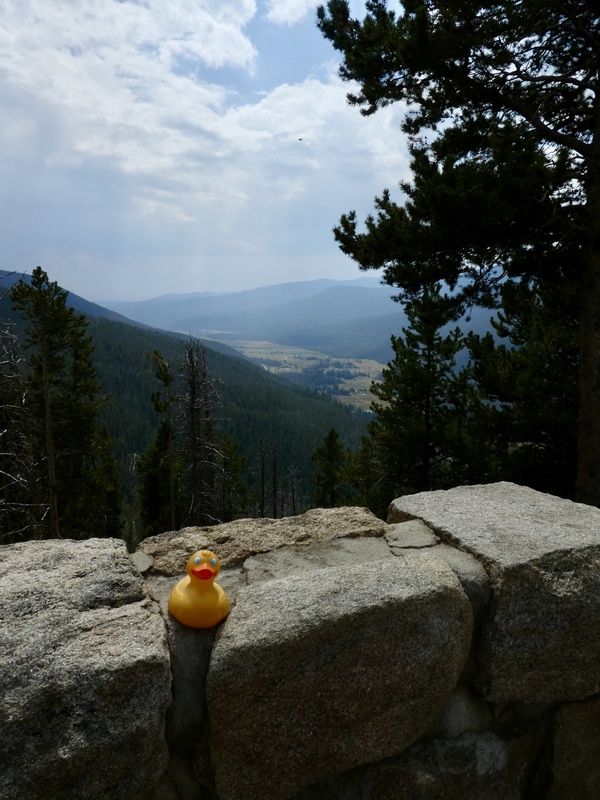 We can drive through Rocky Mountain National Park, on the highest continuous paved road in the United States. Trail Ridge Road connects Grand Lake on the west with Estes Park on the east. But today, we just go a little way into the park. We want to see some elk. Here is one. Elk on the move. We really saw several elk today in several places in the park. Sitting on this fallen tree, we appreciate our Colorado scenery. 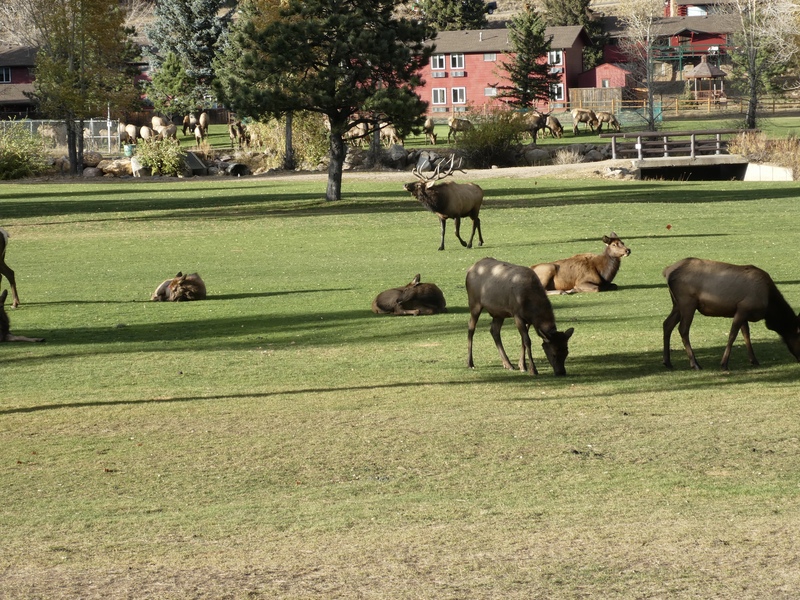 We love our mountains, the meadow, the stream and the elk resting. But mom, what about our store? 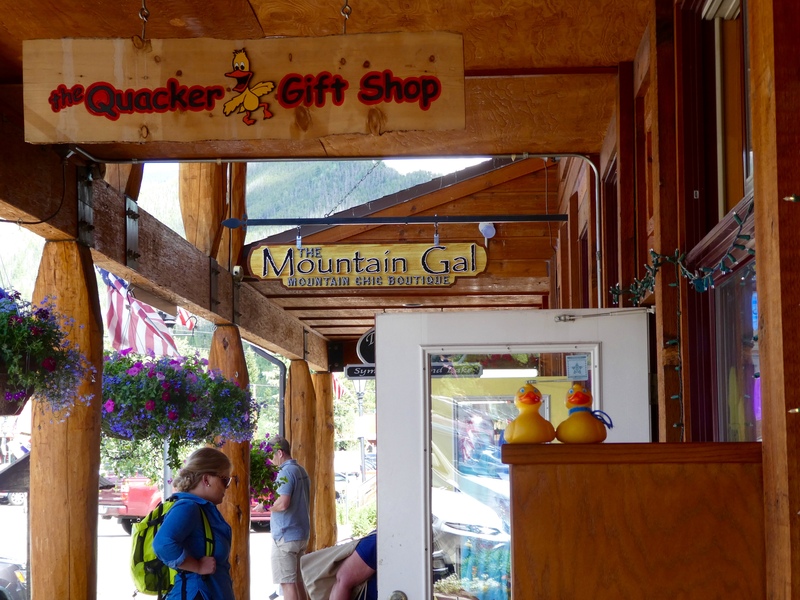 Back in the resort town of Grand Lake, we find The Quacker Gift Shop. 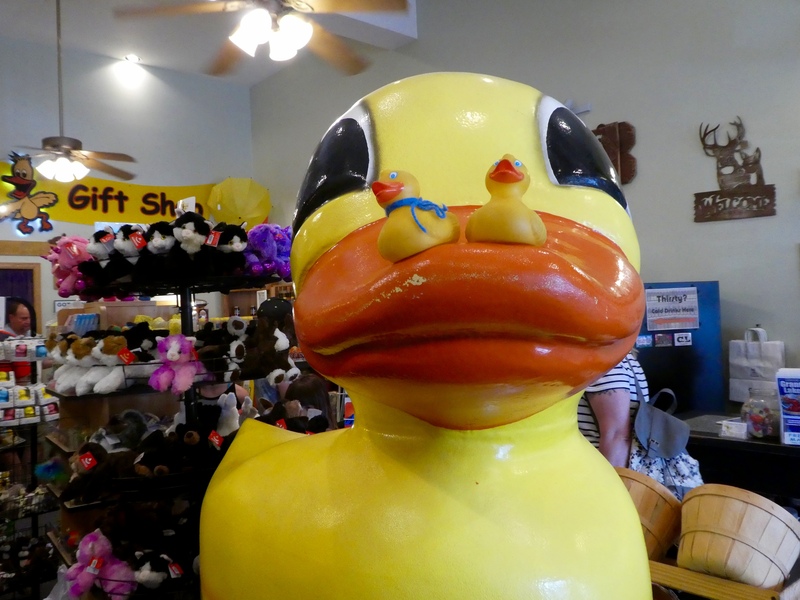 While there are other items available, the main focus of this gift shop is us–rubber ducks! 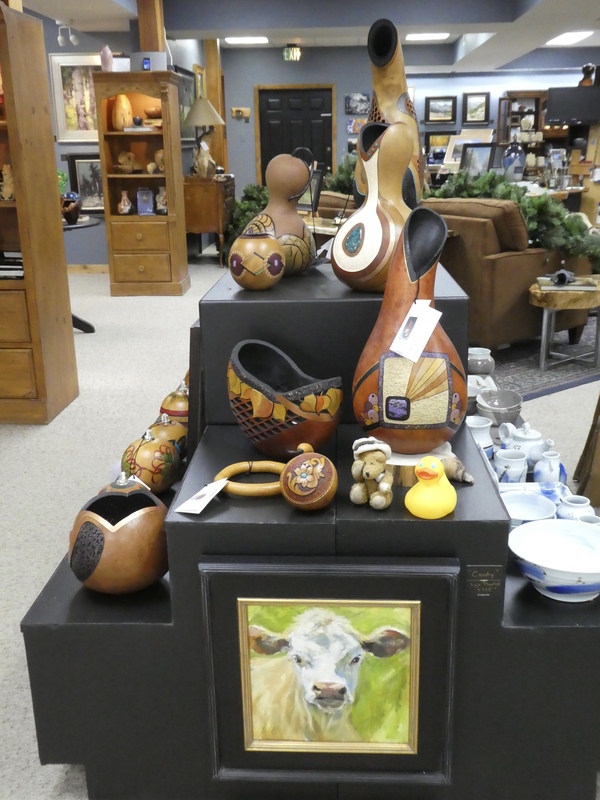 From the vantage point on the large duck’s bill, we can see much of the available merchandise. And there is a lot! 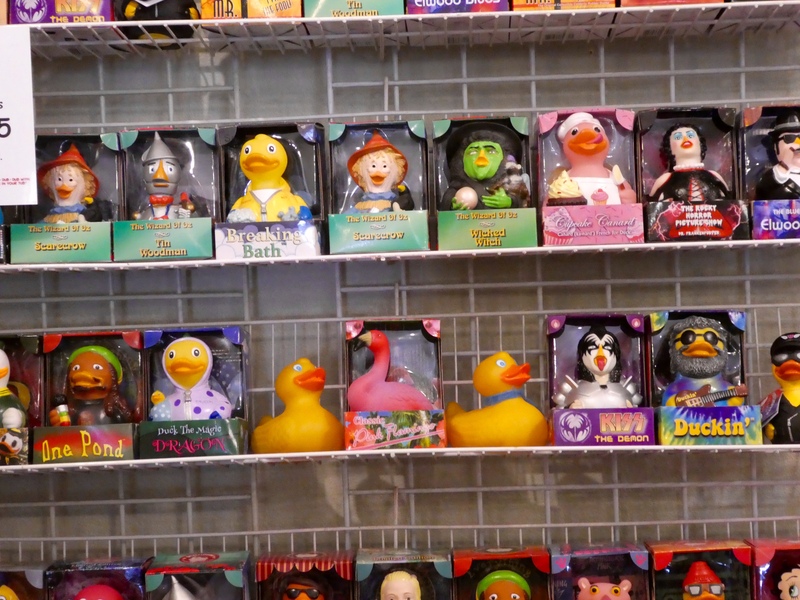 Let’s sit on the top shelf by duck caps and the Jumbo Ducks. 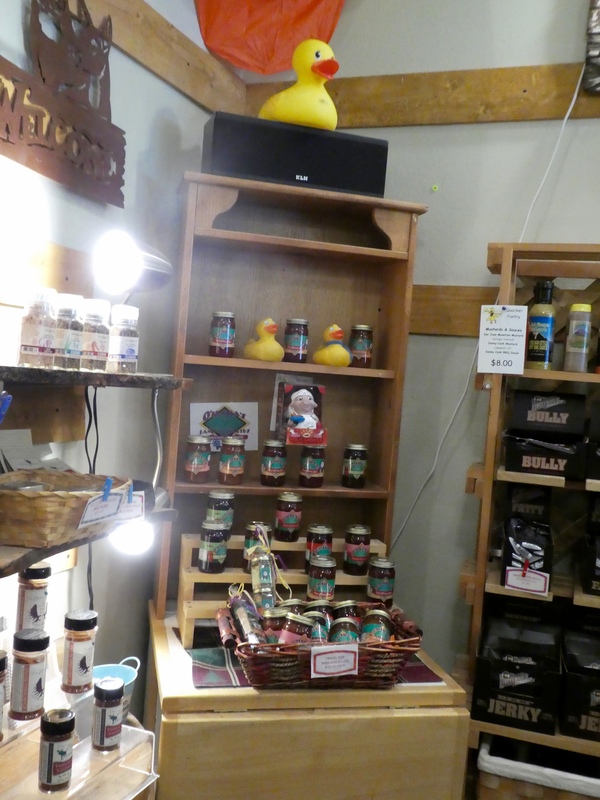 We enjoy this shelf, sitting by locally made jams. Yummy! 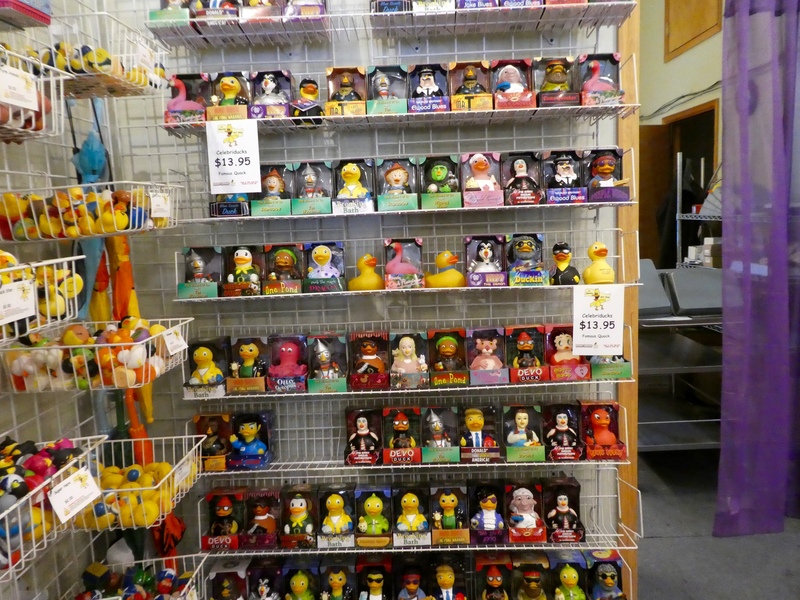 And Celebrity Ducks. So many. Sitting by the pink flamingo, we are near ducks from The Wizard of Oz, a KISS duck and so many more. Of course some new ducks came home to join our family. The moms purchased fresh fudge also. After lunch at The Hub, the fudge was sampled and appreciated. Grand Lake is a town located on Grand Lake, the largest natural lake in Colorado. Isn’t the lake pretty? Grand Lake was formed by glaciation about 30,000 years ago. Glaciers are gone and we have a beautiful recreation area. On the beach some children built a sand castle. The swimming area is clearly separated from the boating area for everyone’s safety. And boats. Boats can be rented by the hour. Maybe next time. 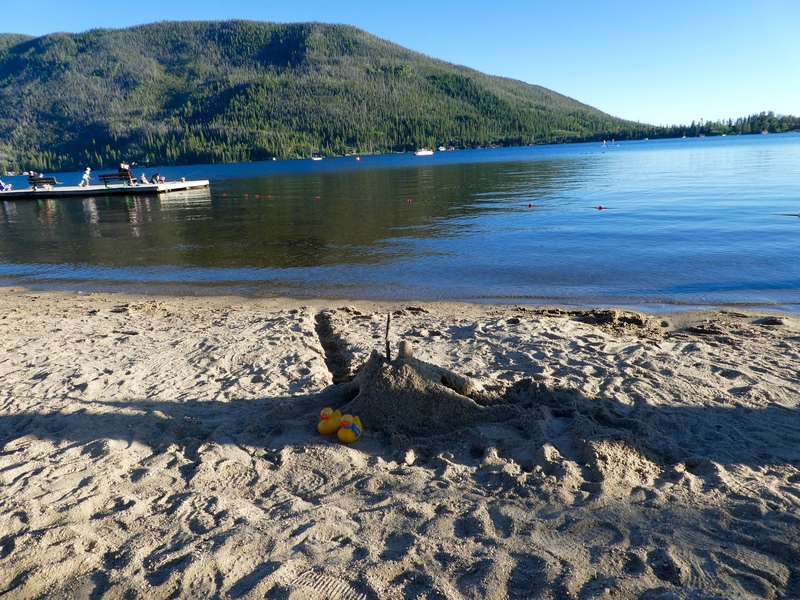 We didn’t allow enough time to fully enjoy Grand Lake. Boat tours are also available. We will be back here. 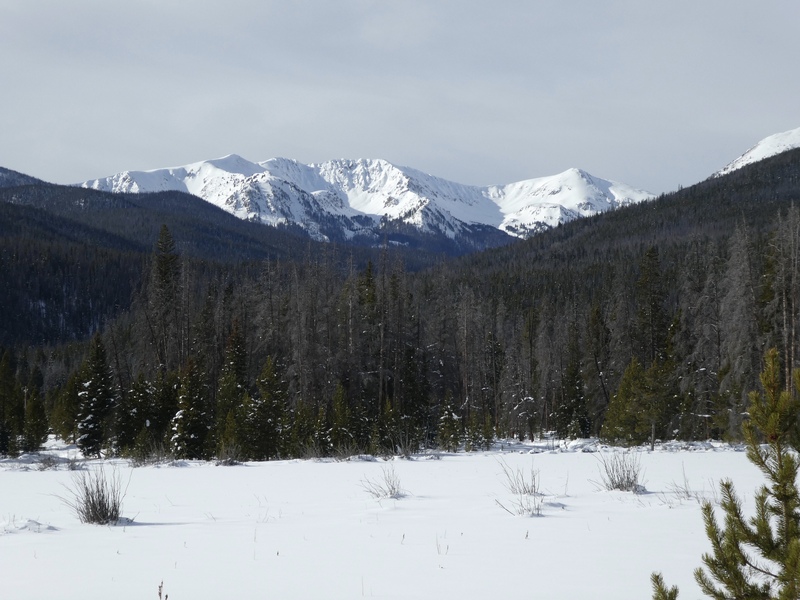 Grand Lake has long been known as the headwaters of the Colorado River. And the mighty Colorado River carved the Grand Canyon, one the top natural wonders of the world. Grand Lake is about 2 hours from our home near Denver. We can come for a day, a weekend or a week. But, we will be back here often. 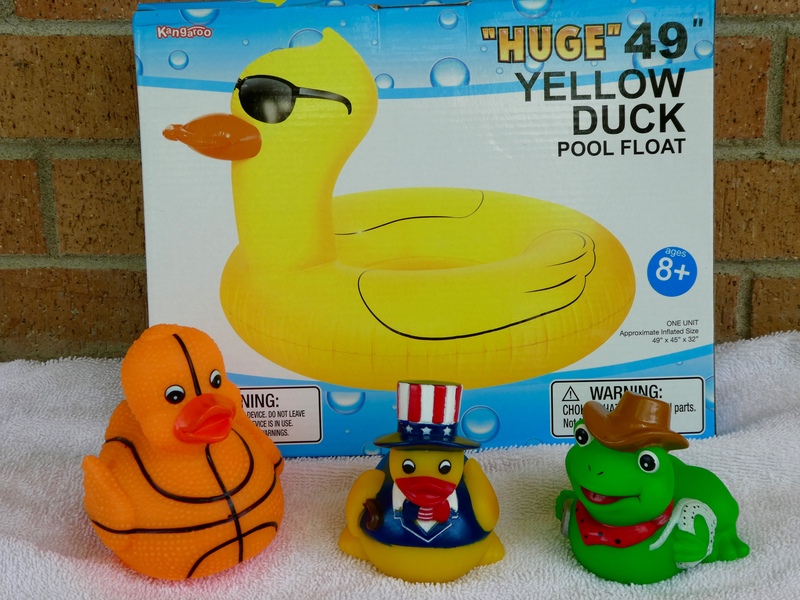 We ducks must revisit the gift shop dedicated to us and rubber ducks everywhere. 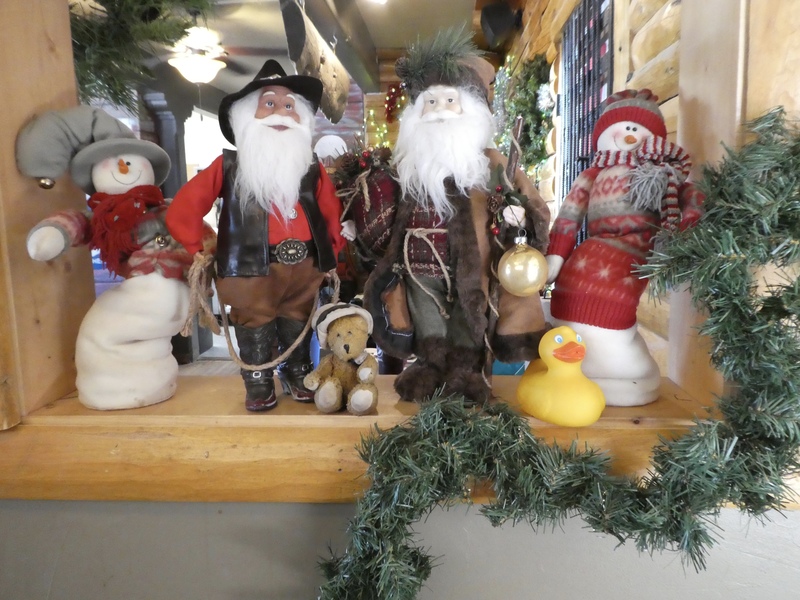 We the Colorado Traveling Ducks and their humans wish you all a very Merry Christmas. Today is the day Christians all over the world celebrate the birth of Jesus. We wish you all a Very Merry Colorado Christmas. 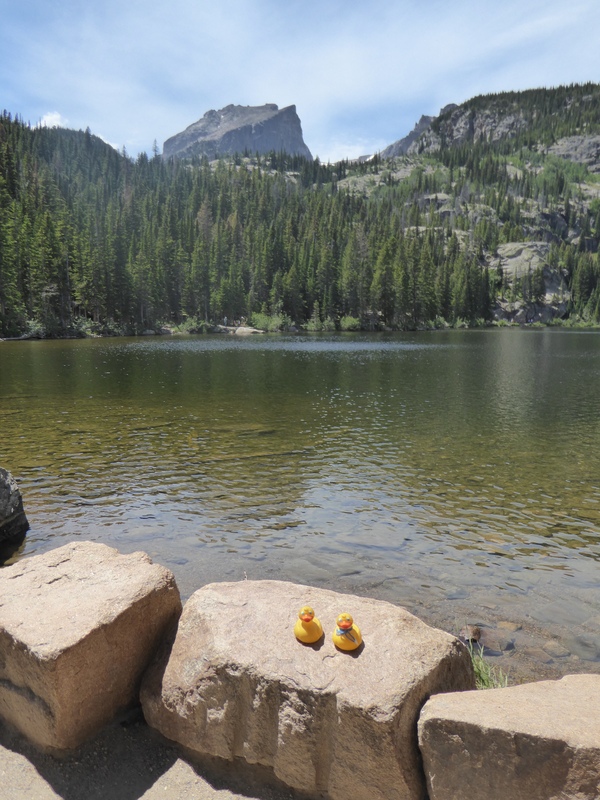 Today I, Zeb the Duck, and Soapy Smith Duck, are going with our moms toward Estes Park. 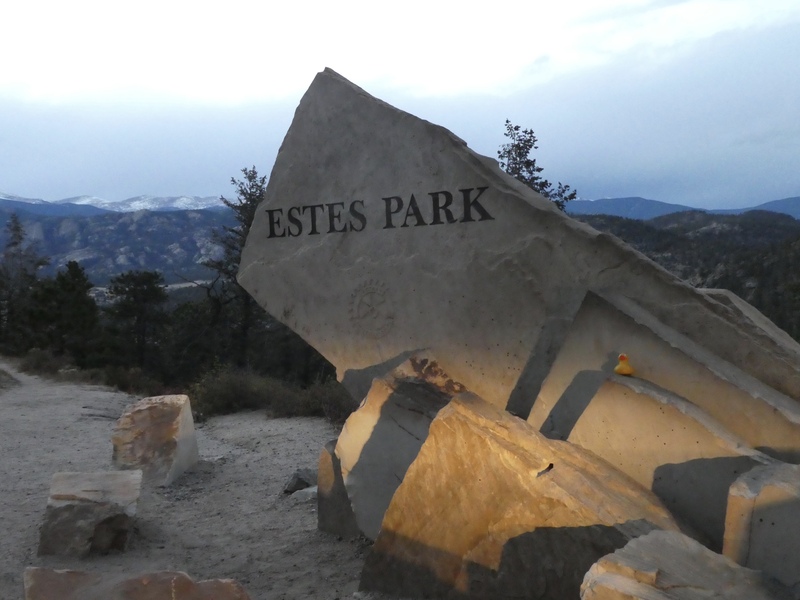 We all love Estes Park. 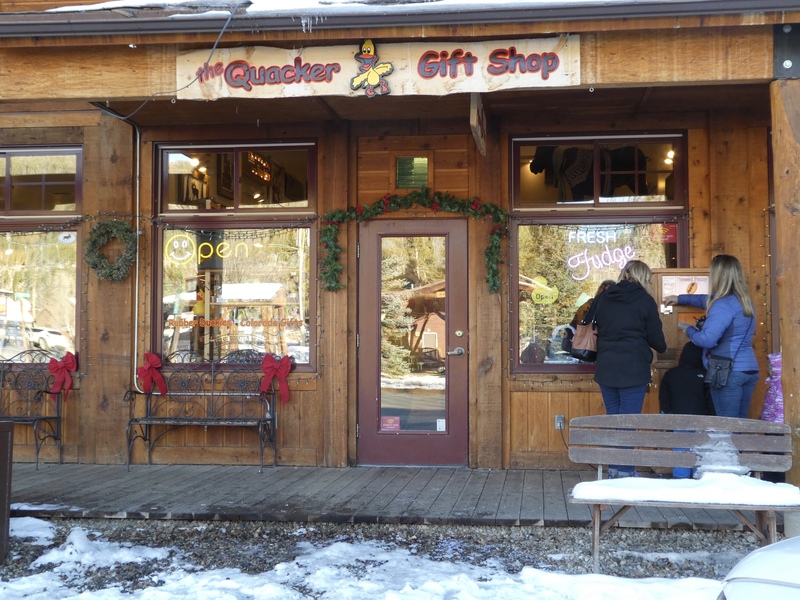 It is a great mountain resort town near Rocky Mountain National Park, about 90 minutes from home. 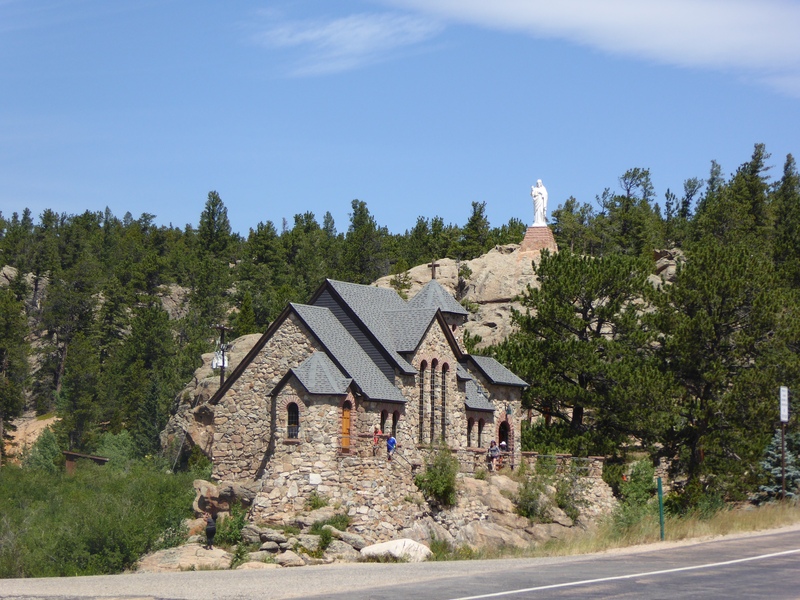 Chapel on a Rock, or Saint Catherine of Siena Chapel is our first stop. In 1916 Monsignor Joseph Bosetti was on a quest to find the impact site of a falling star when he found this rock formation. Remembering the Bible verse Matthew 16:18, upon this rock I will build my church, the Monsignor wanted to build a church here. But he had no funds. 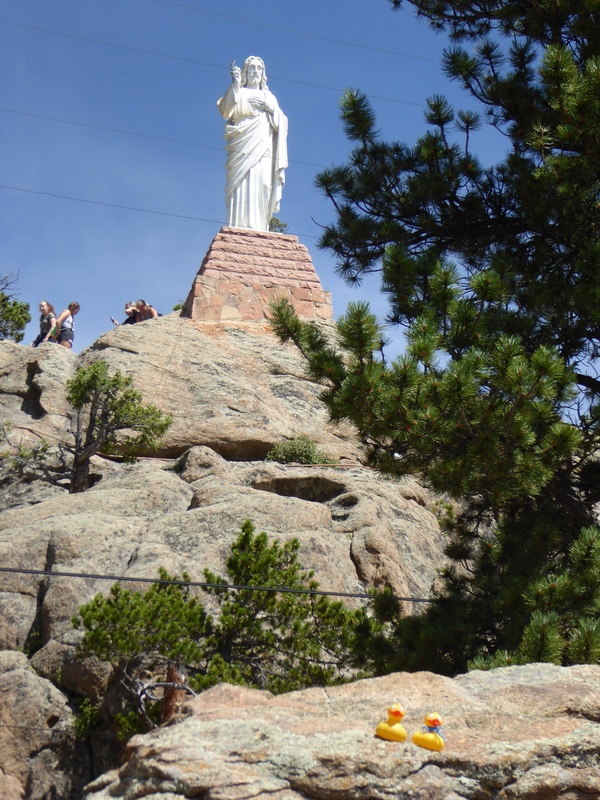 For 20 years he prayed and struggled with the Colorado Highway Department to keep his Rock intact. The land was purchased and then donated by Mr. and Mrs. Oscar Malo. In 1936, twenty years after first seeing the rock, the chapel was completed. The statue is very prominent, also. This chapel is beautiful with Mount Meeker as a backdrop. The sanctuary is very nice. 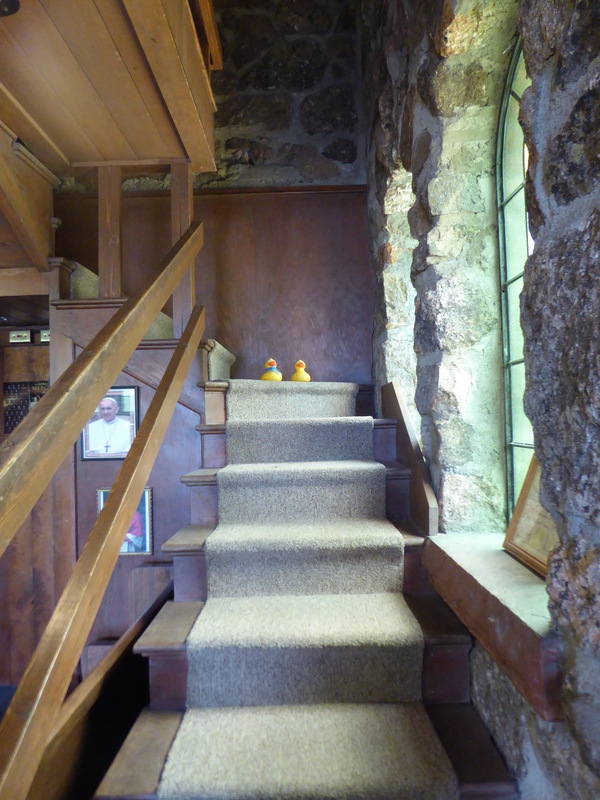 The stairs lead to the loft. This view is also nice. The official name of this chapel is Saint Catherine of Siena Chapel. This Franz Mayer stained glass window, depicts Saint Catherine holding the body of Christ on the cross. The statue of soft wood was made in Giacomo Mussner Studios in Bolzano, Italy. 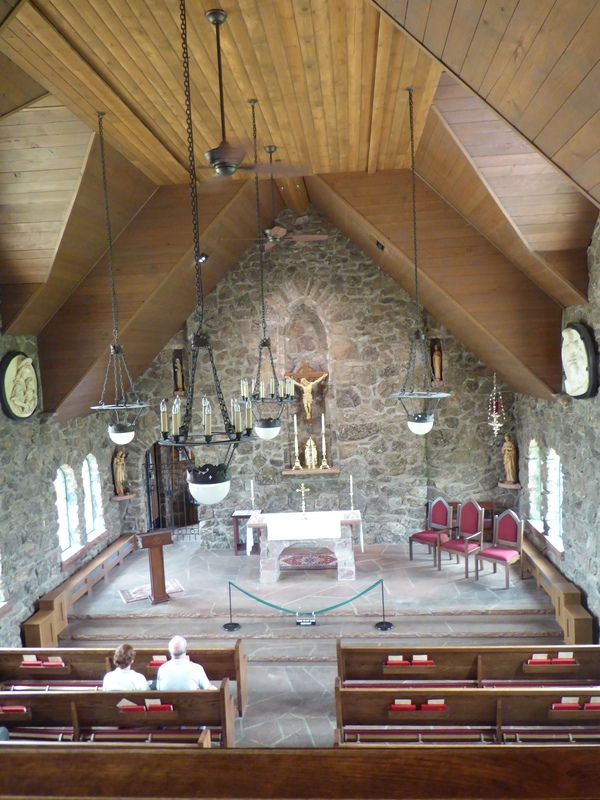 The chapel was part of the Camp Saint Malo Catholic Retreat, Conference and Spiritual Center. The main building burned in 2011, but the chapel was not damaged. 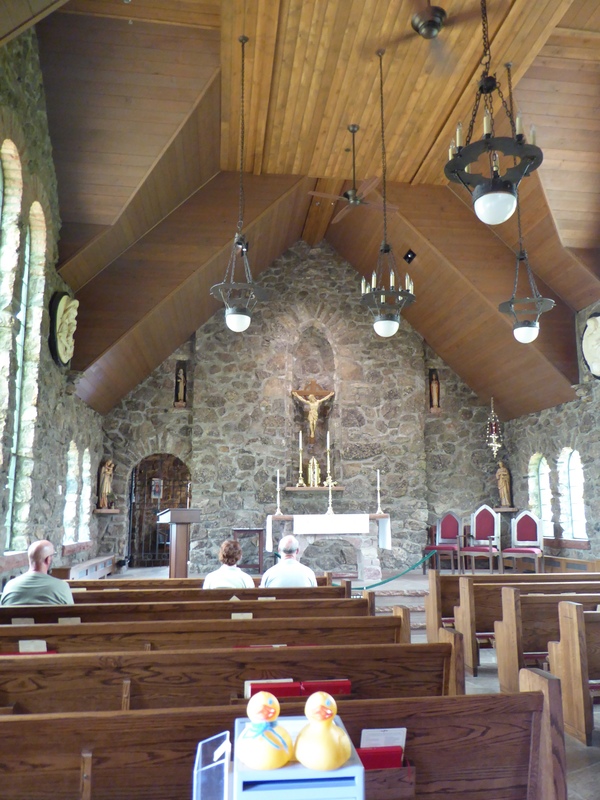 In 2013 during the floods, debris from a mountain slide destroyed much of the trails and other buildings, but again, the chapel was not damaged. 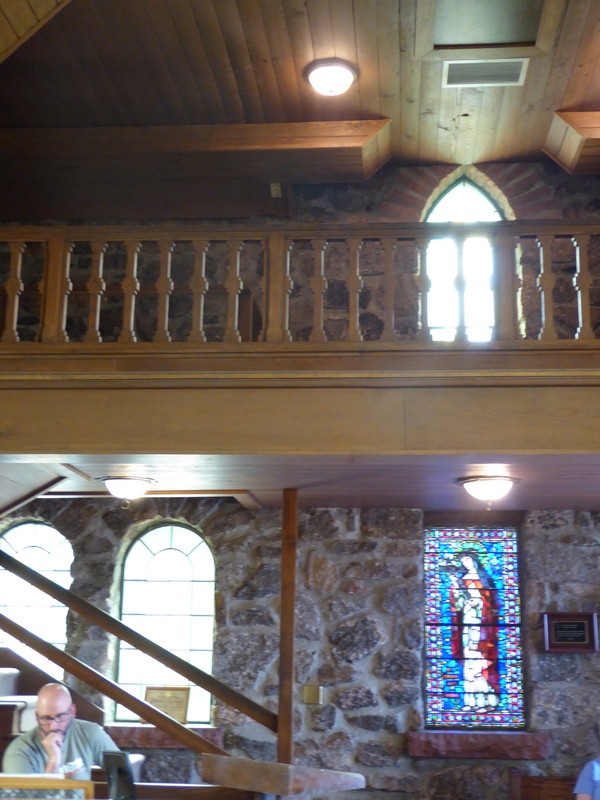 The chapel is open to the public and available for weddings and other occasions. 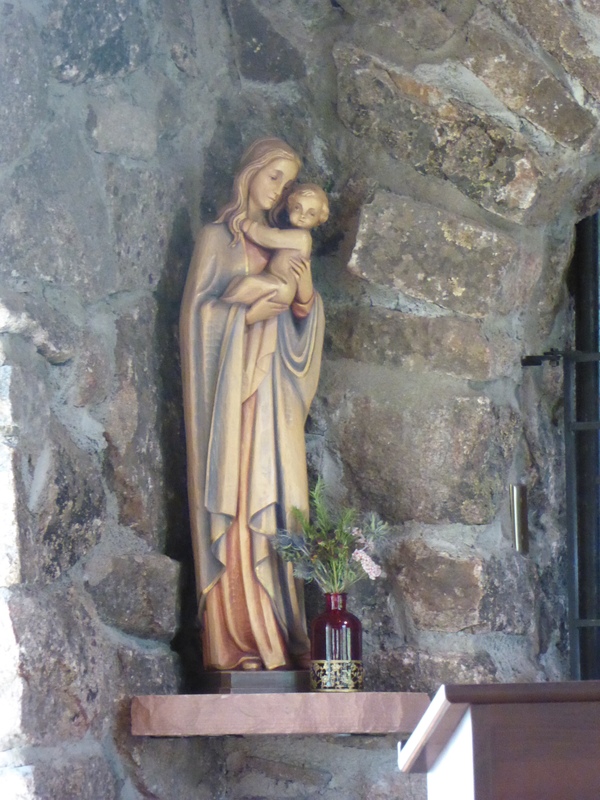 In 1993 Pope John Paul II visited this chapel and hiked some of the mountain trails. 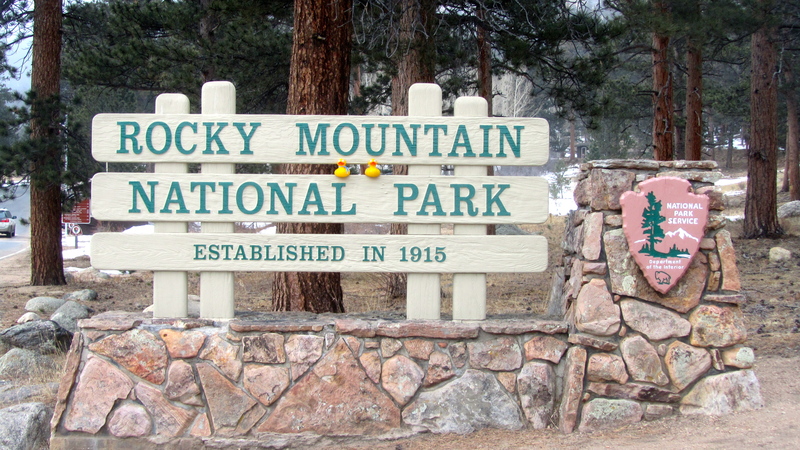 Next we visited Rocky Mountain National Park. This is a favorite place for us. Today we drove to Bear Lake. There is a half mile trail around the lake. 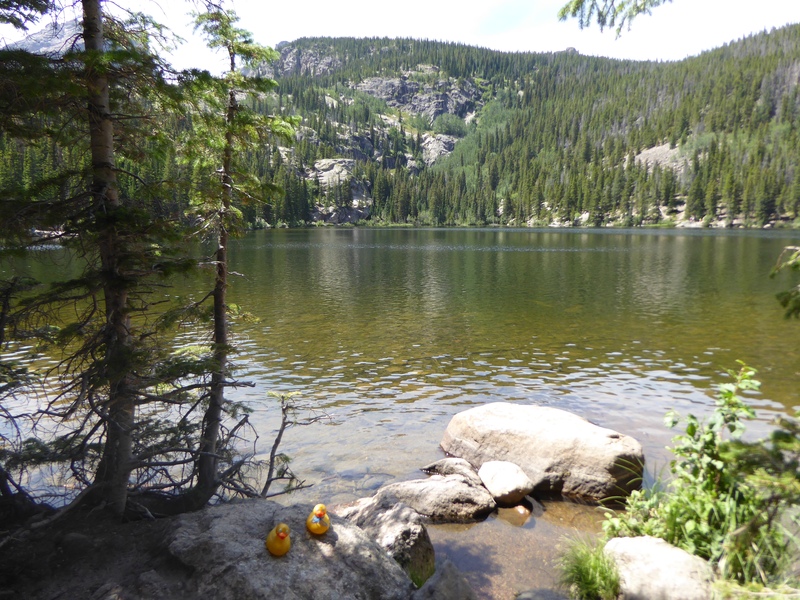 This is our favorite short hike in Rocky Mountain National Park. Soon it started to rain, so we went into Estes Park and had lunch at the Stanley Hotel. 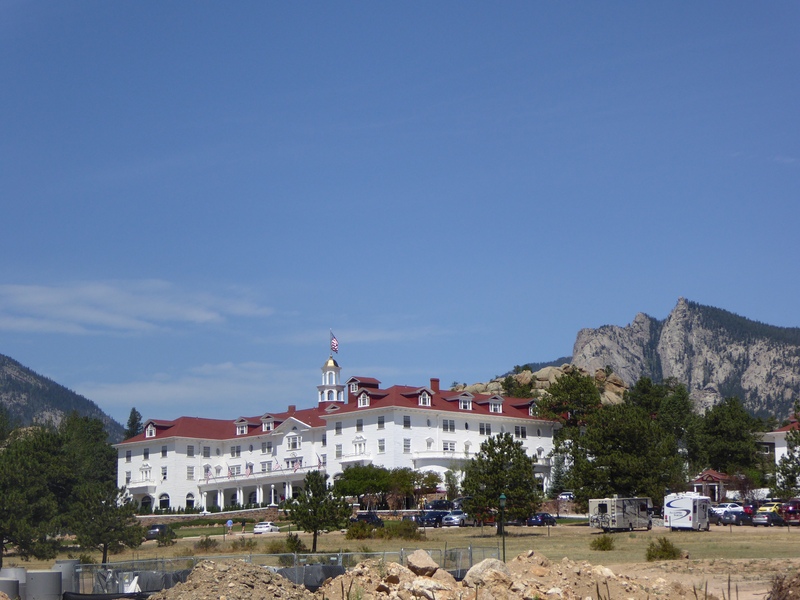 Our moms said we could come back here soon and spend the night at the famous Stanley Hotel. When we do, we will tell you about this hotel and if we see any ghosts. The most visited of Colorado’s four National Parks is 101 years old today. 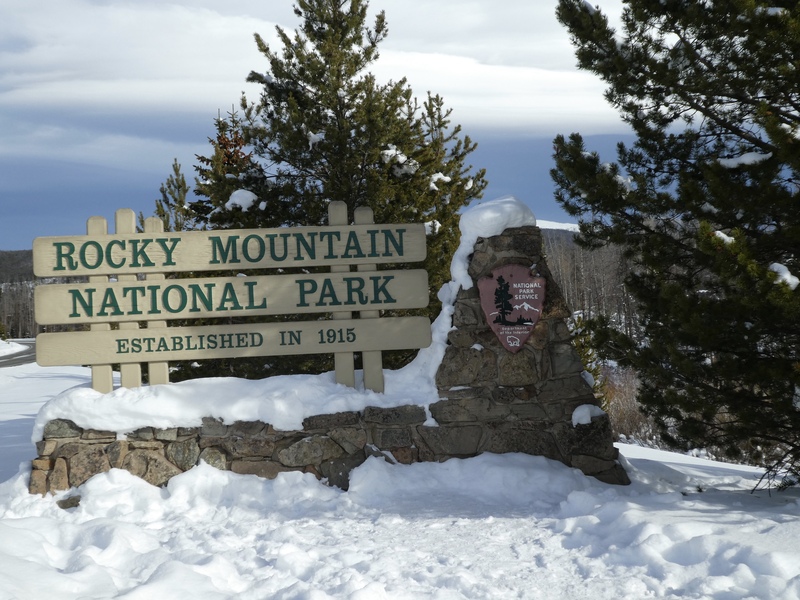 Rocky Mountain National Park came to exist January 26, 1915 when President Woodrow Wilson signed the bill creating our National Park. 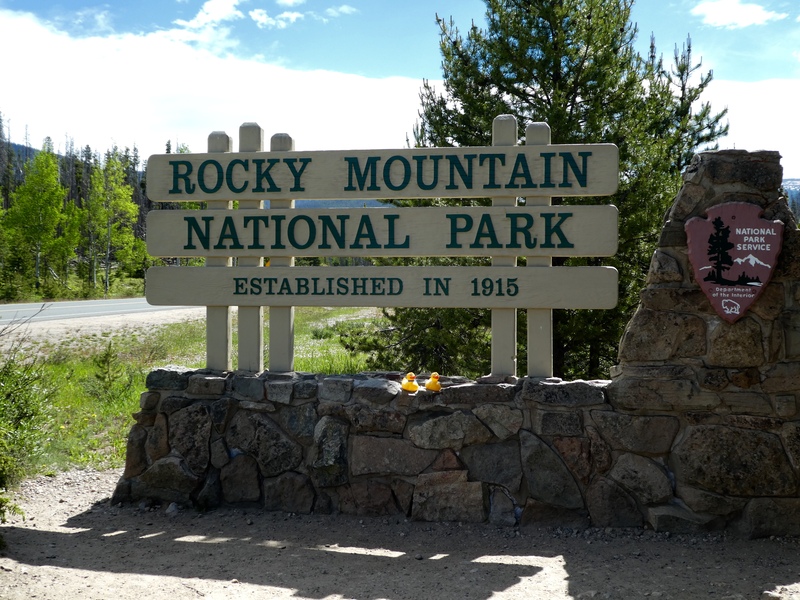 This park has many attractions; the most notable is Trail Ridge Road. 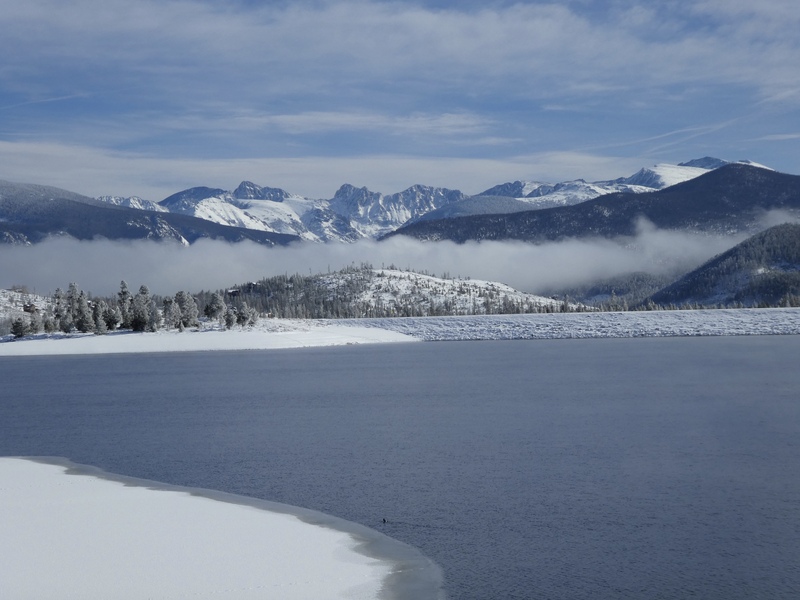 This road, connecting the towns of Grand Lake on the west and Estes Park on the east, reaches 12,183 feet and crosses the Continental Divide. The road, US 34 is the highest continuous highway in the United States. Trail Ridge Road closes in the winter, due to snow. 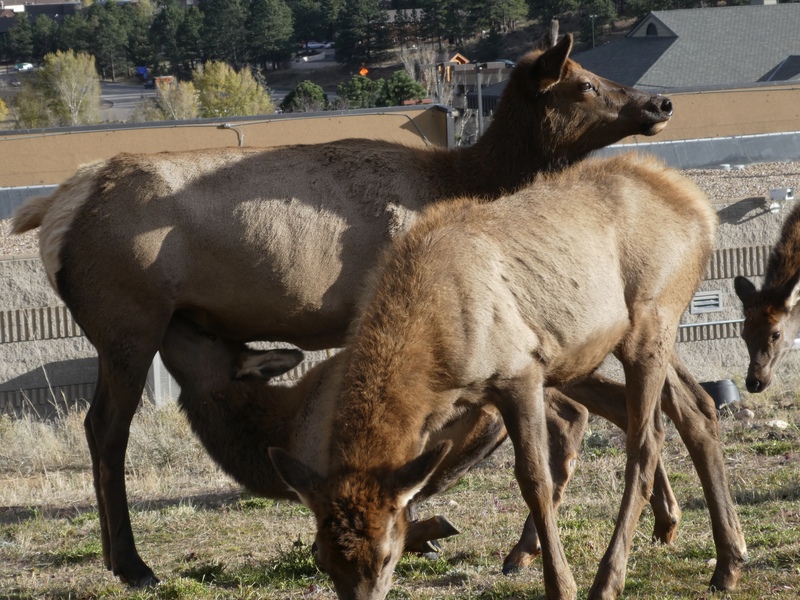 Rocky Mountain National Park has much wildlife, including large elk herds, prompting Estes Park to hold Elk Fest every fall. Hiking, mountain climbing and camping are just a few activities enjoyed by park visitors. When in Colorado we hope you visit all of our National Parks: Rocky Mountain National Park, Black Canyon of the Gunnison National Park, Great Sand Dunes National Park, and Mesa Verde National Park.